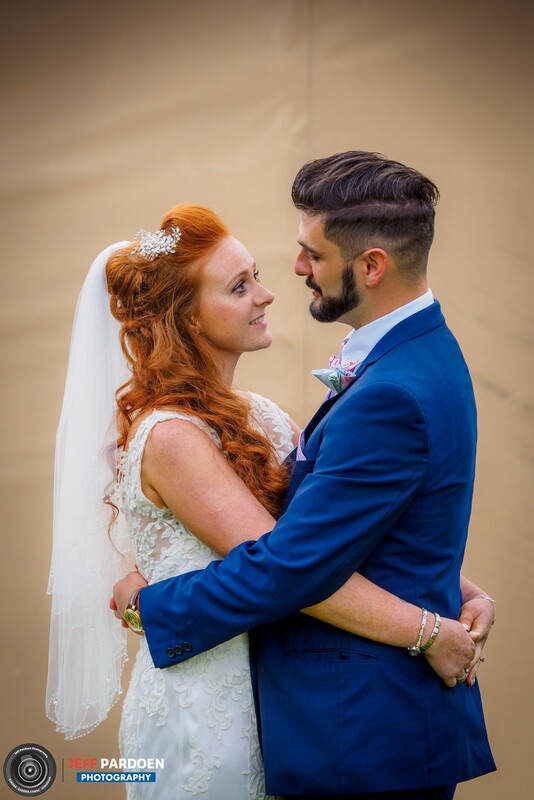 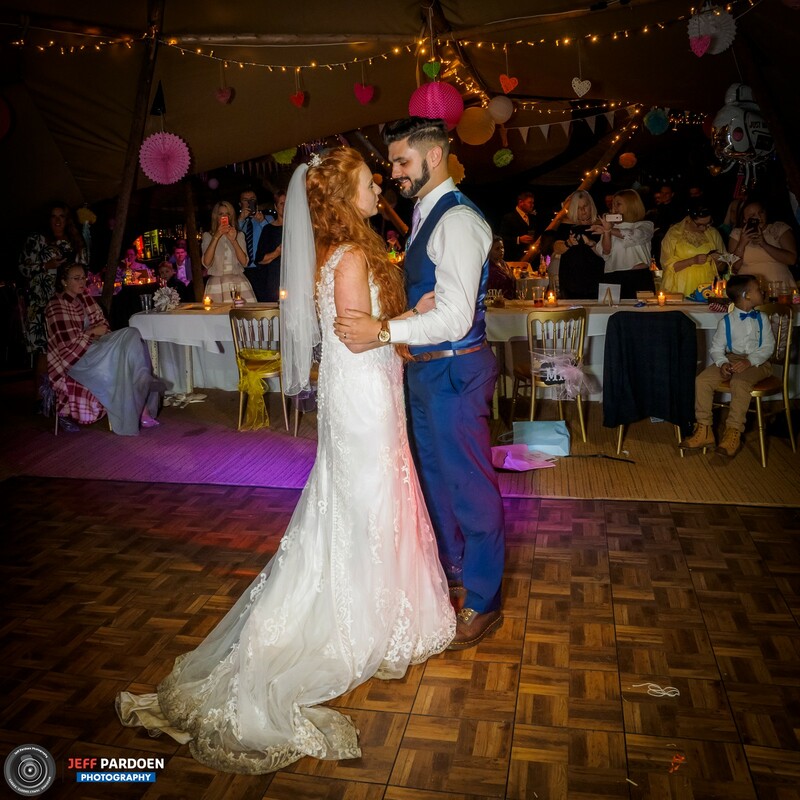 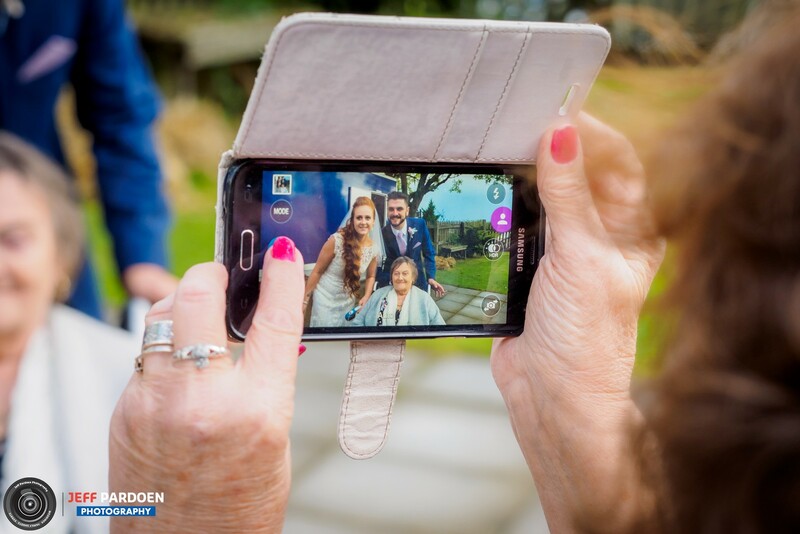 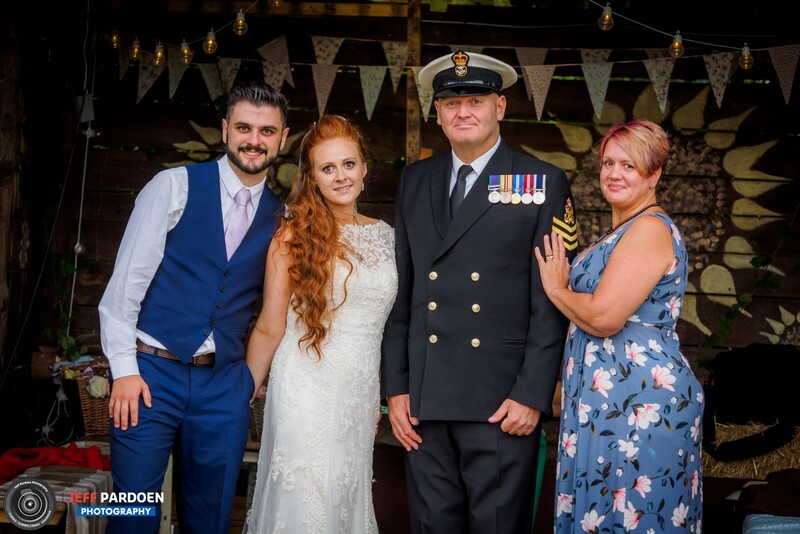 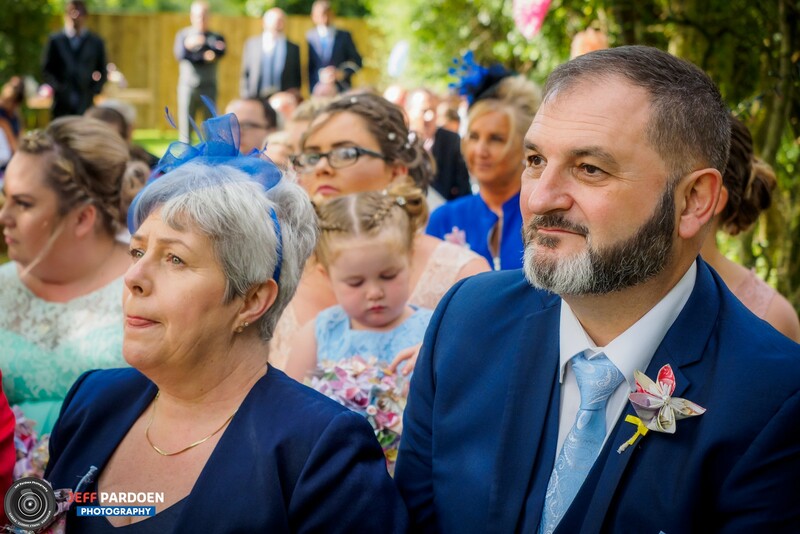 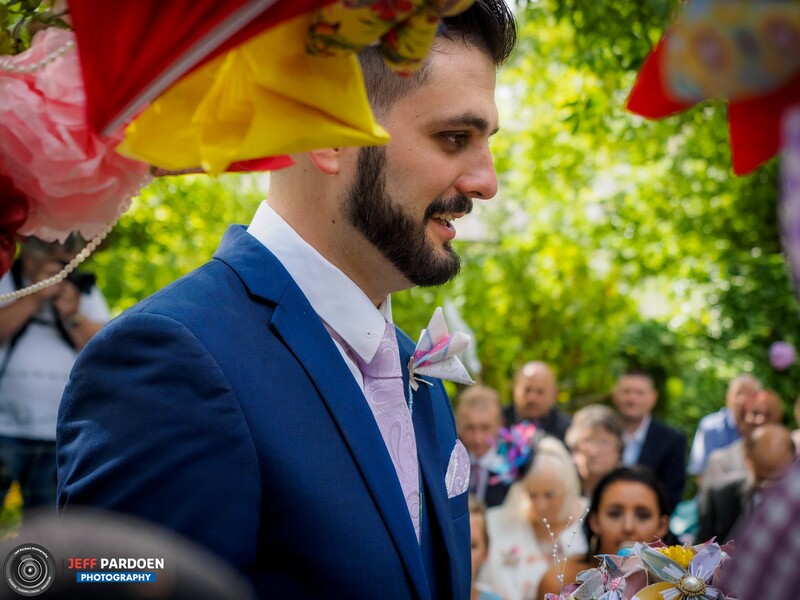 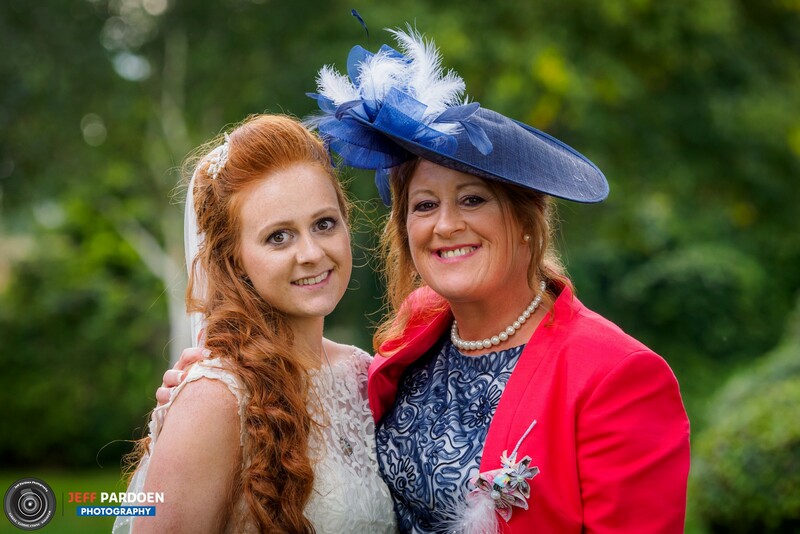 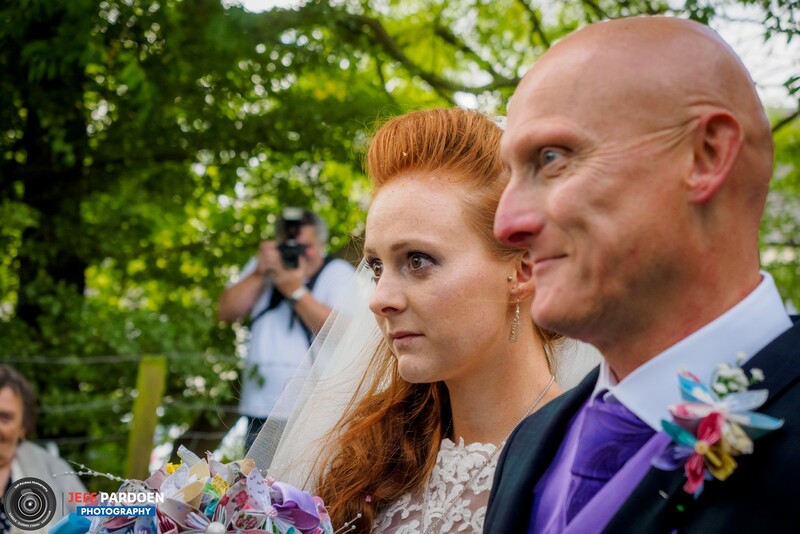 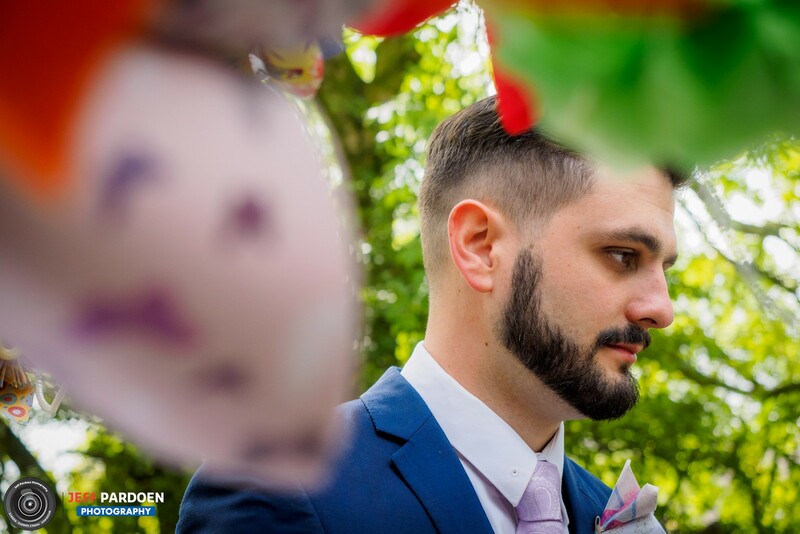 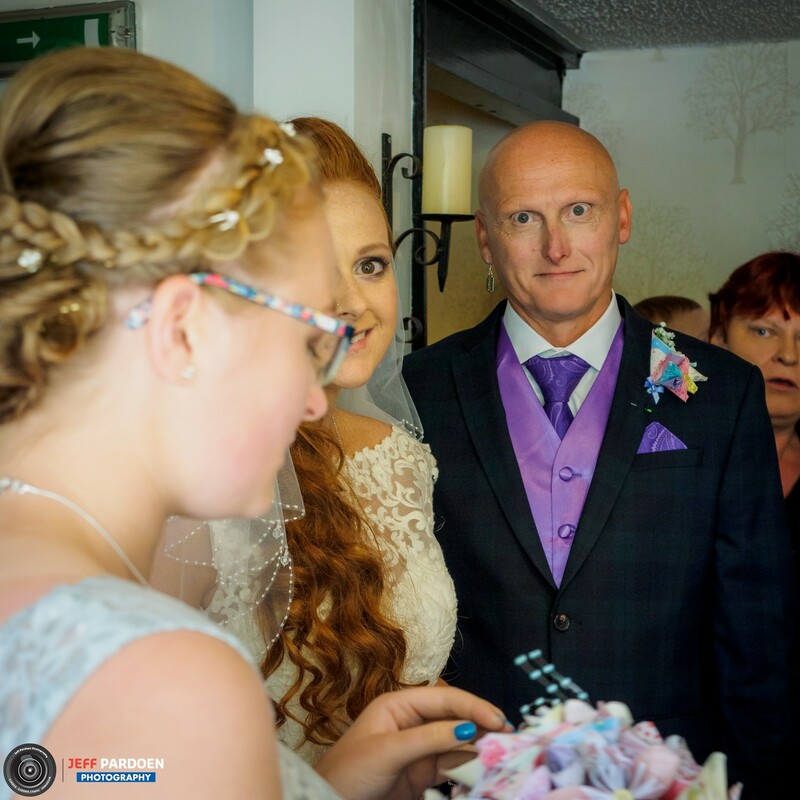 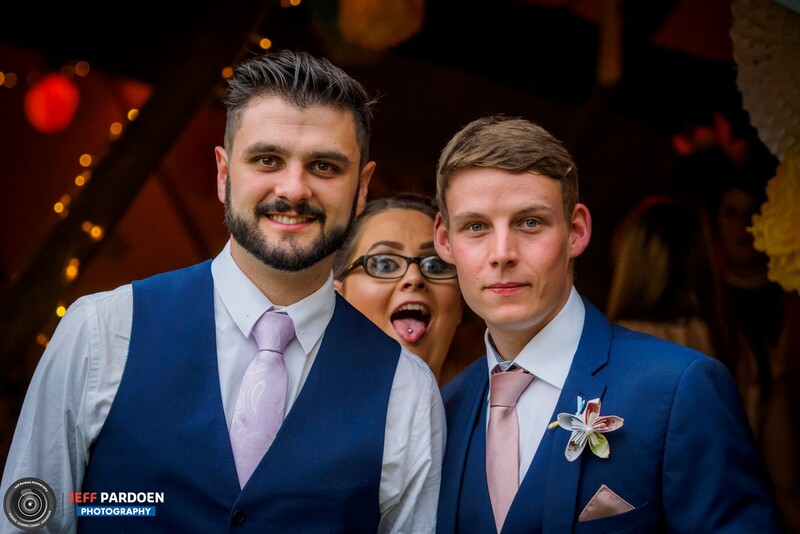 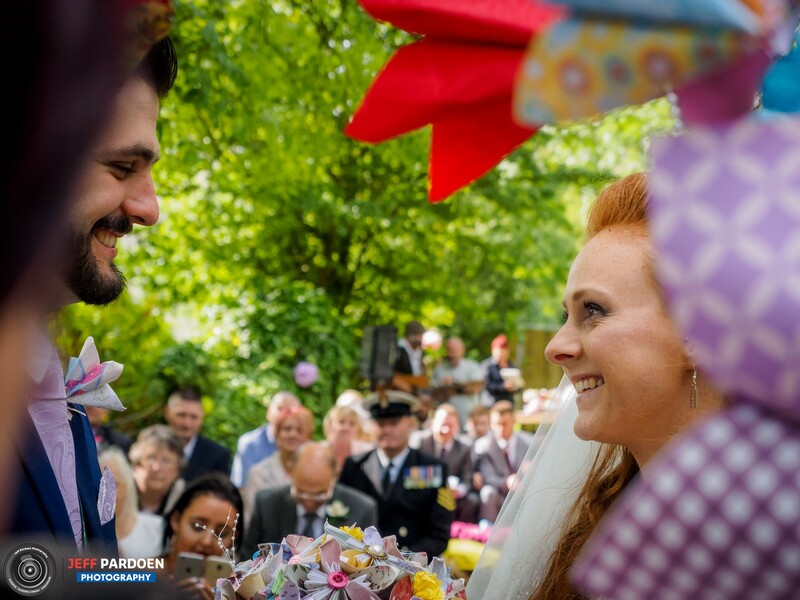 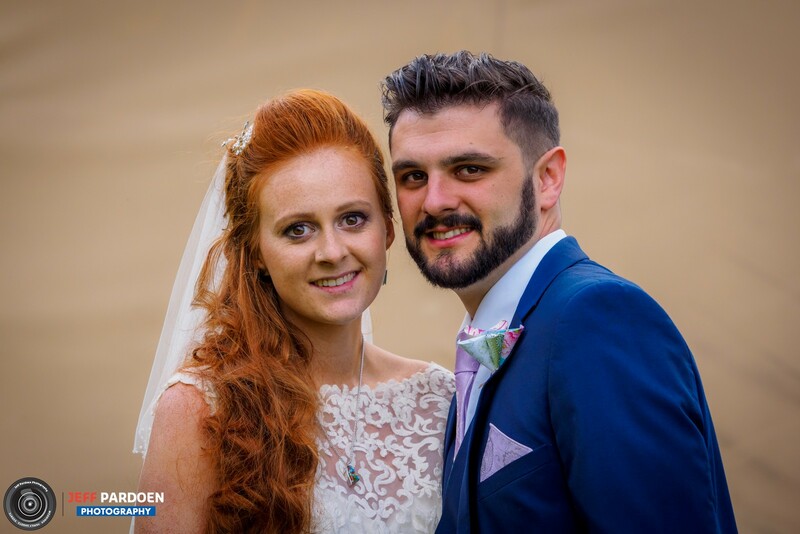 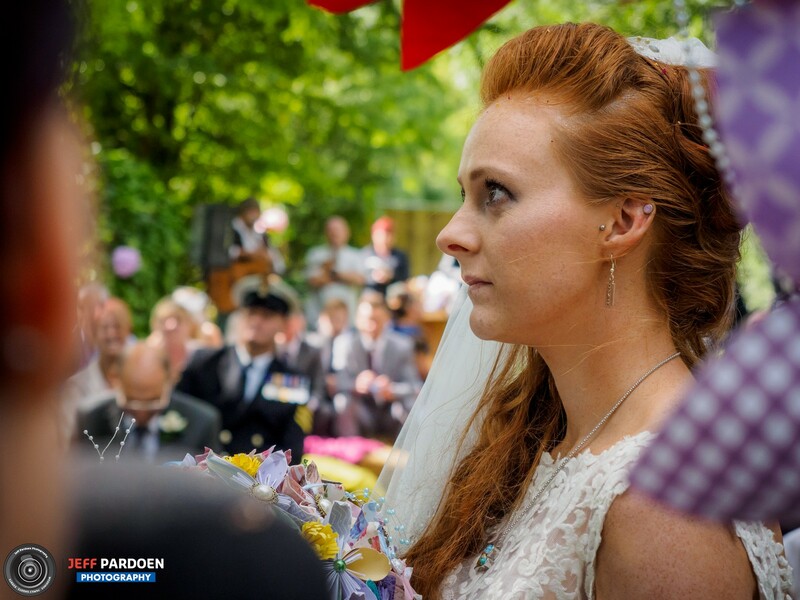 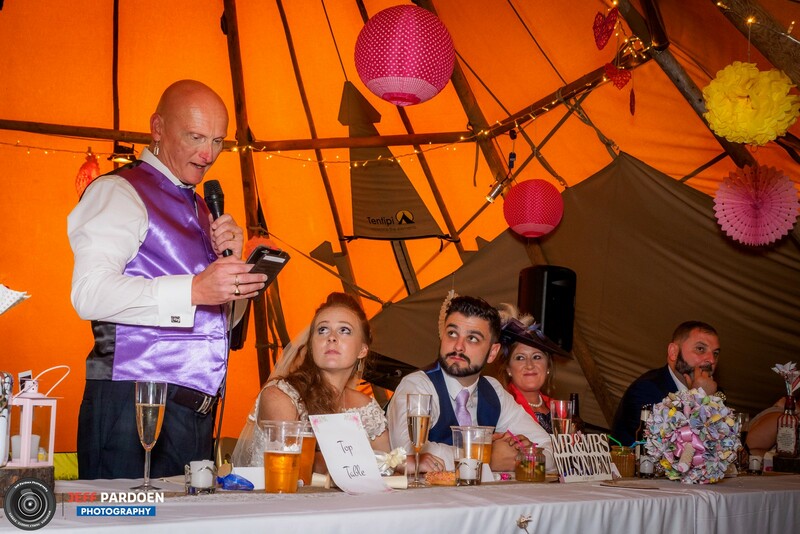 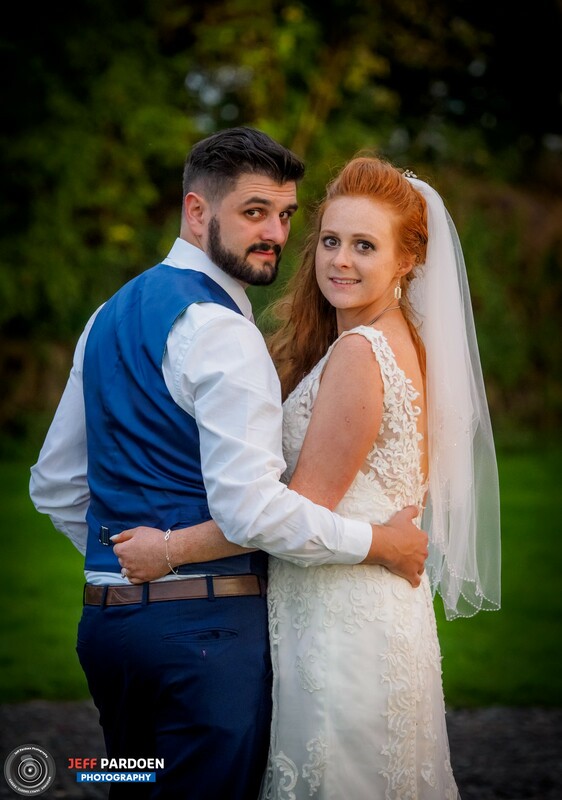 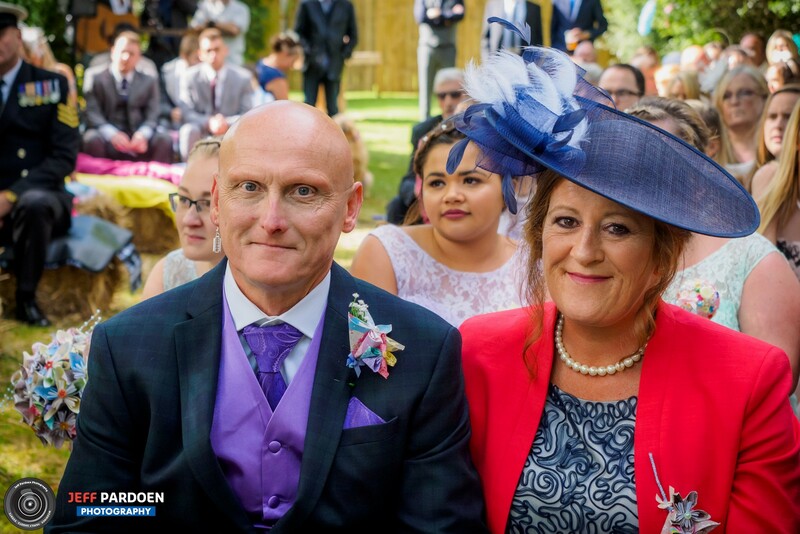 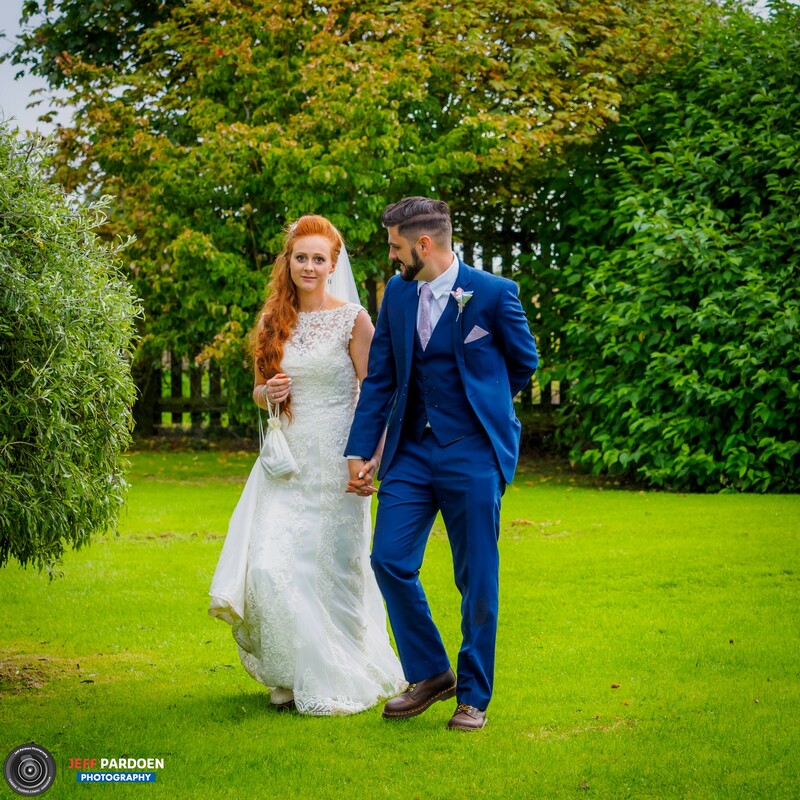 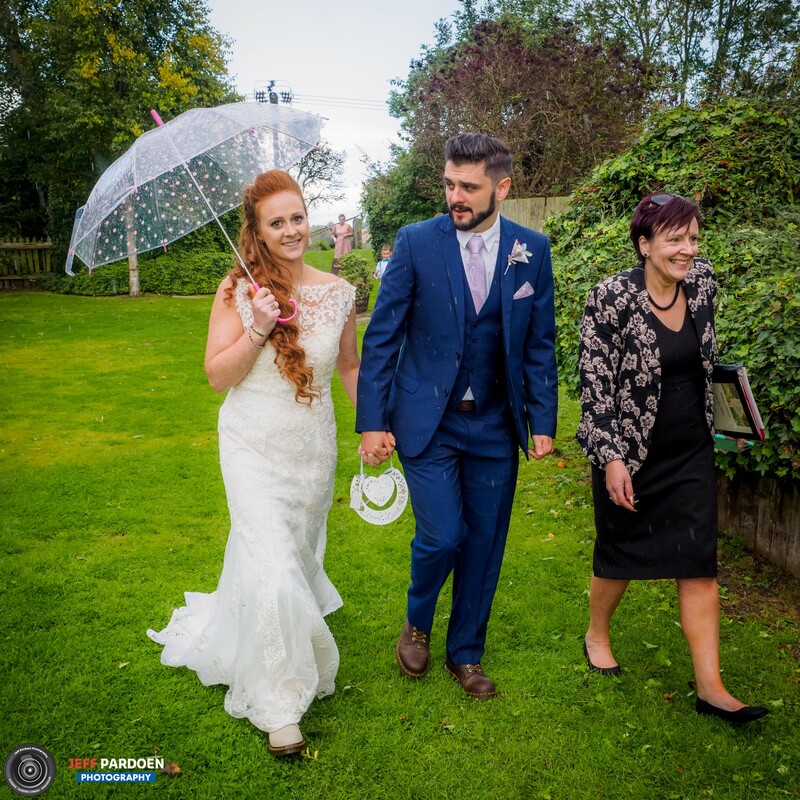 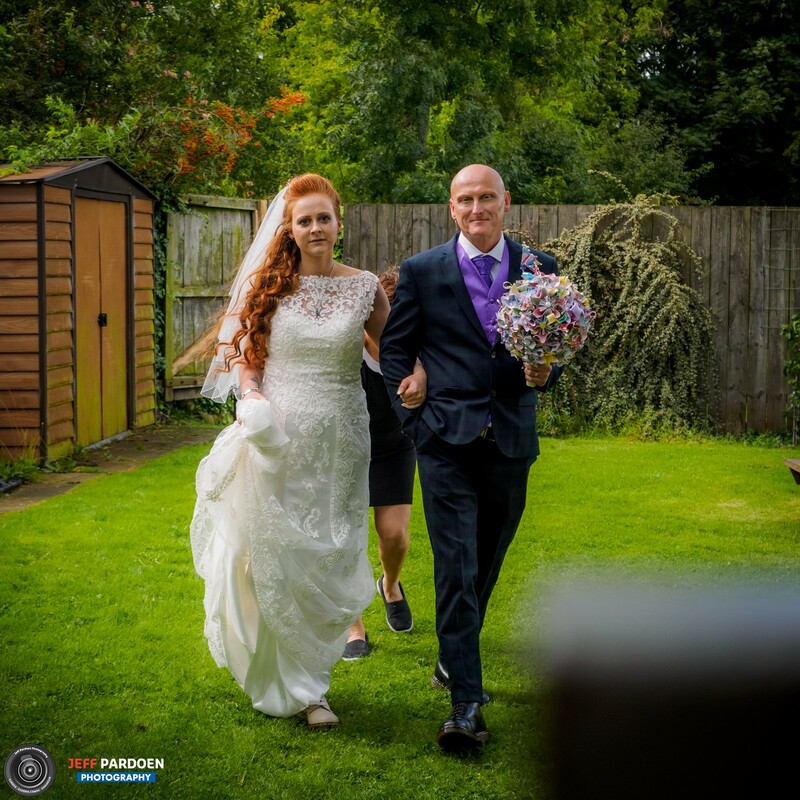 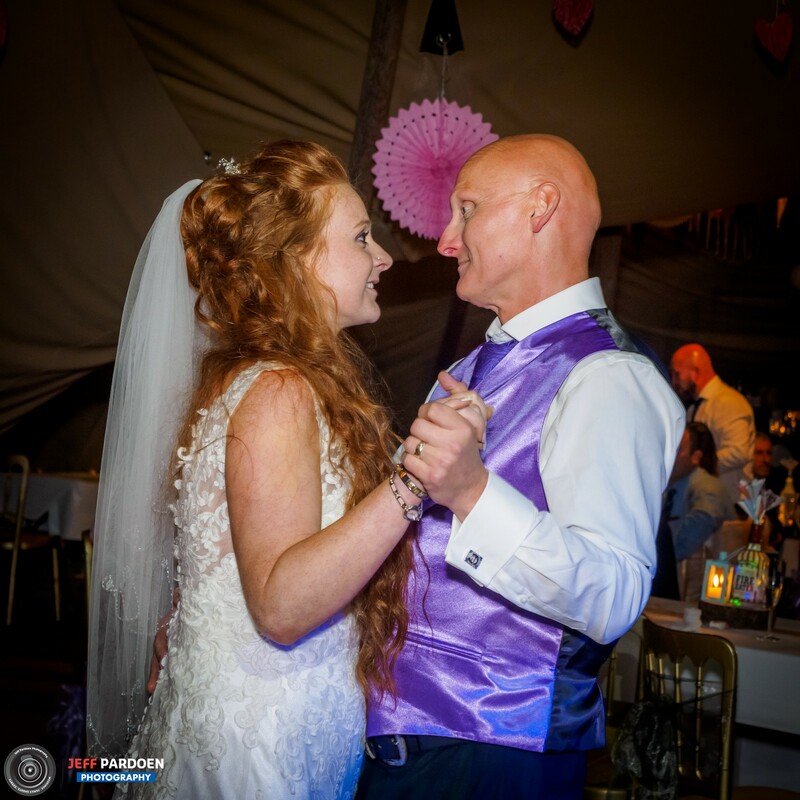 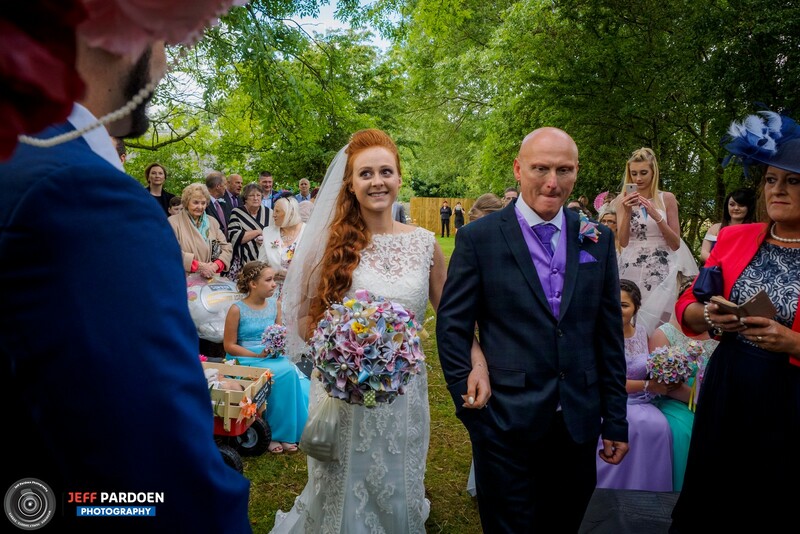 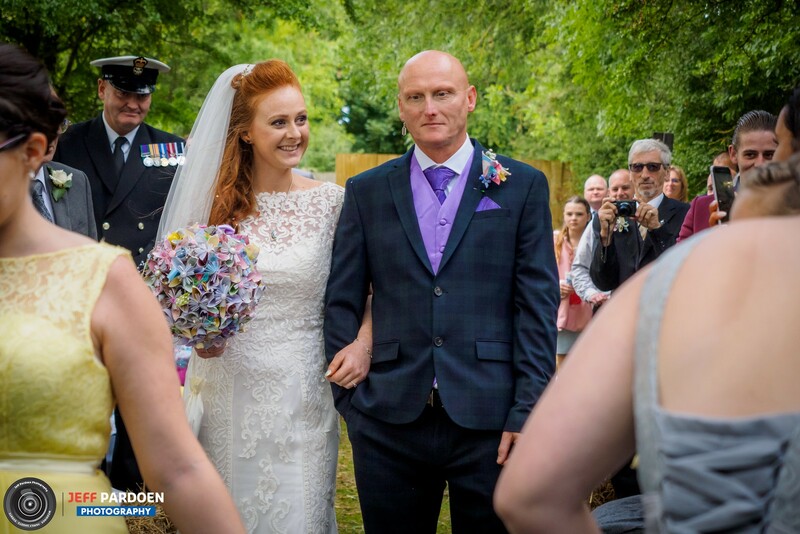 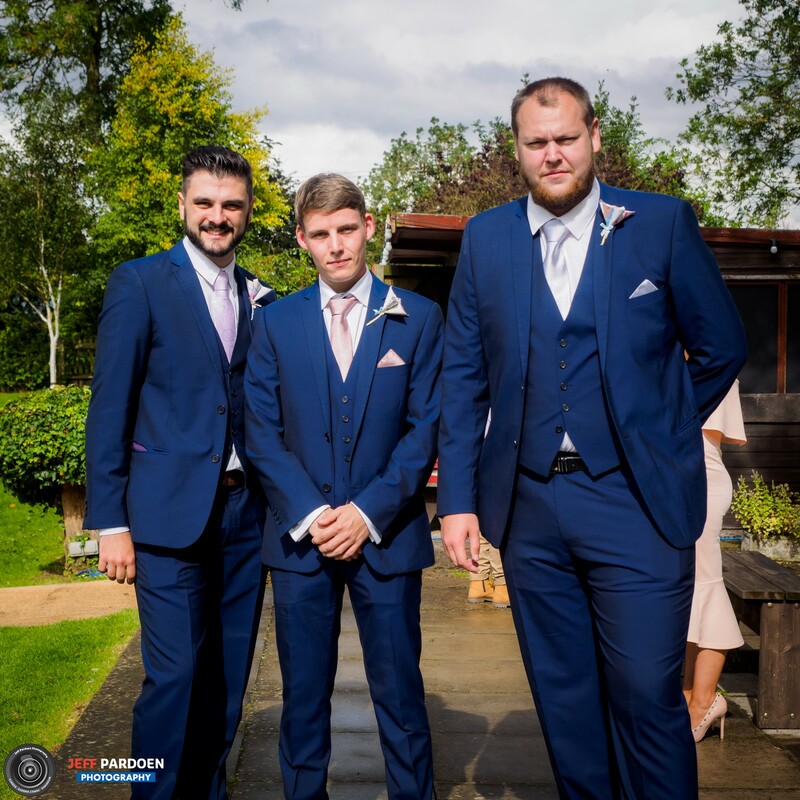 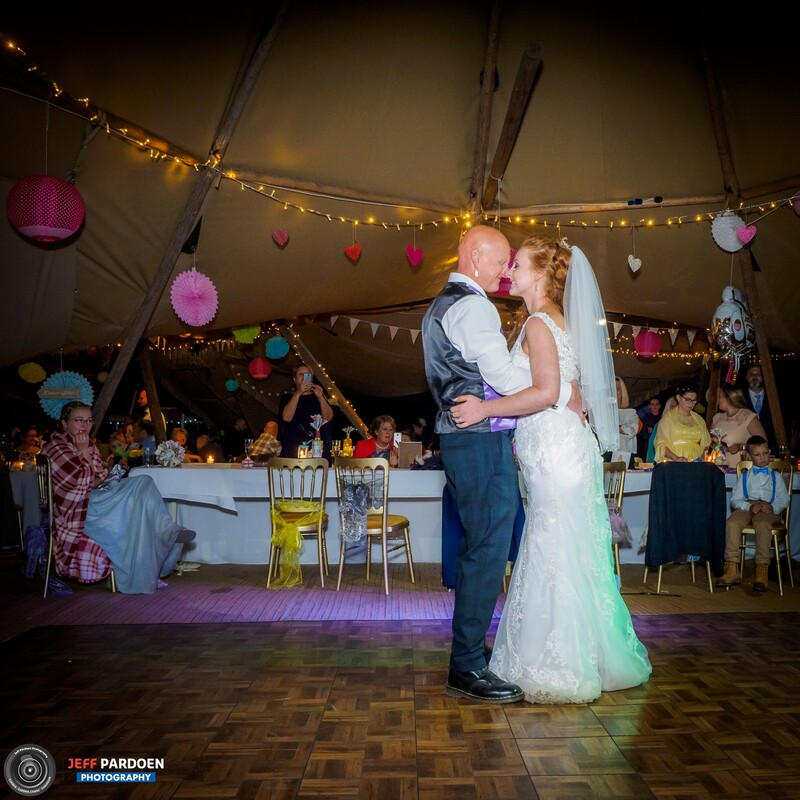 On the 9th September I had the pleasure to photograph Laura and Lyle’s wedding at Hammer & Pincers in Preston-le-Skerne. 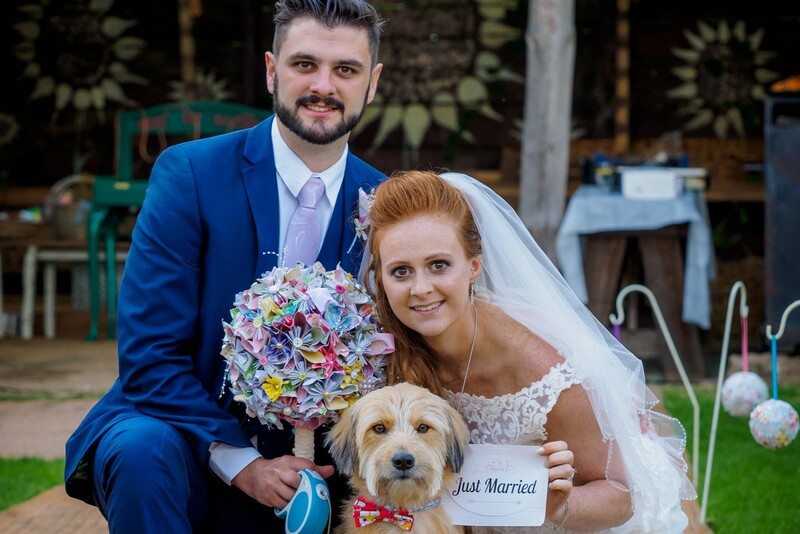 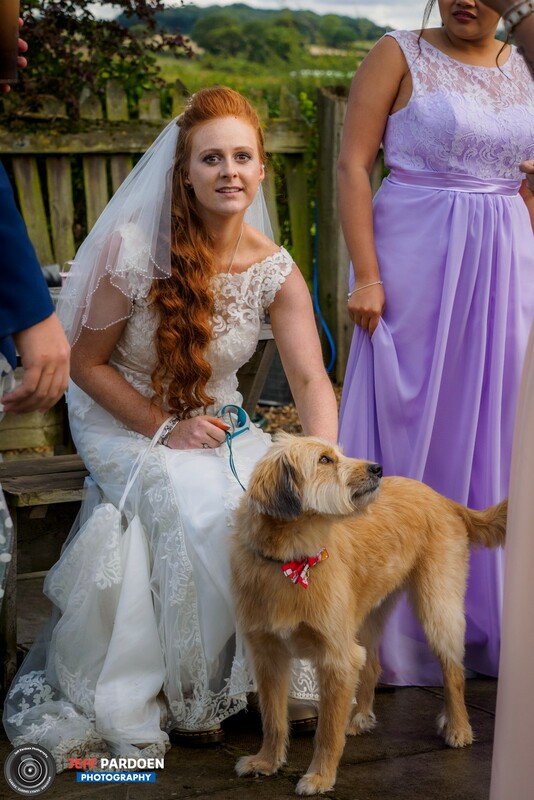 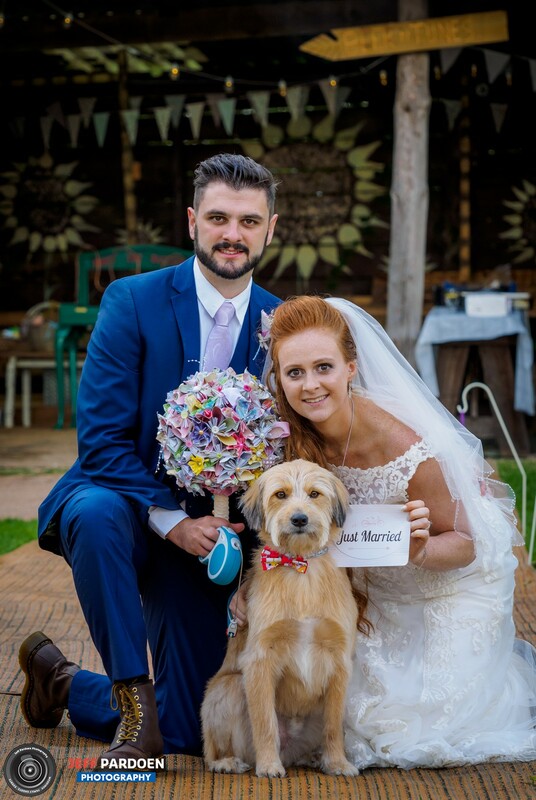 The picture above shows Laura and Lyle at their pre-wedding shoot when Seamus’s humans were getting married and next to it his humans were just married! 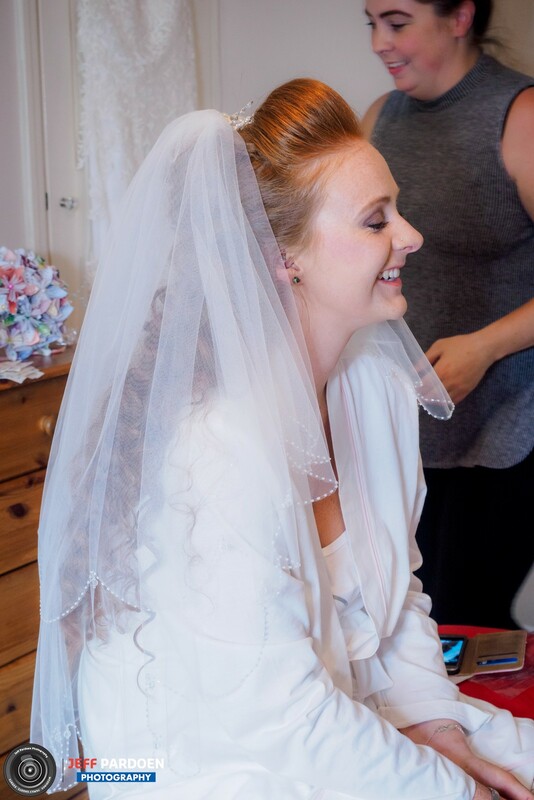 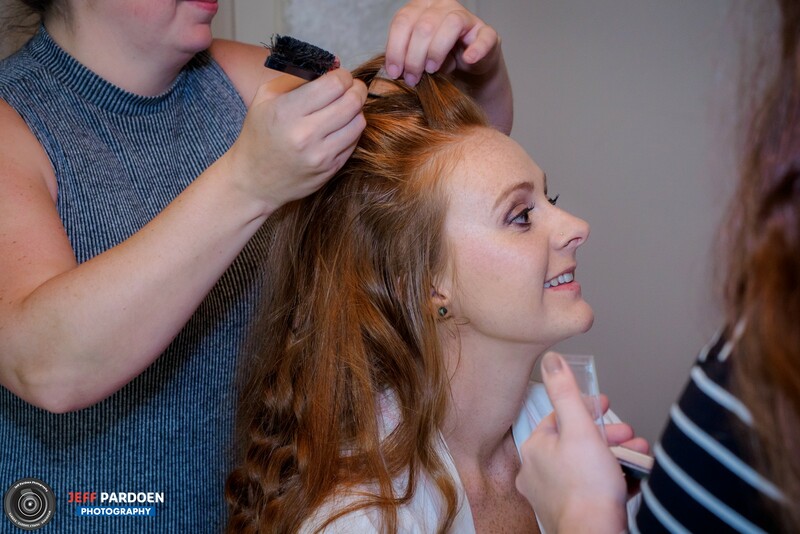 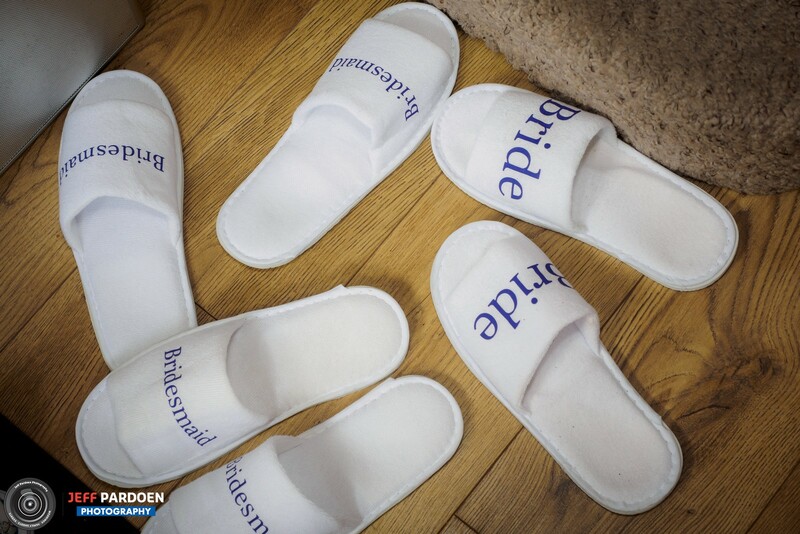 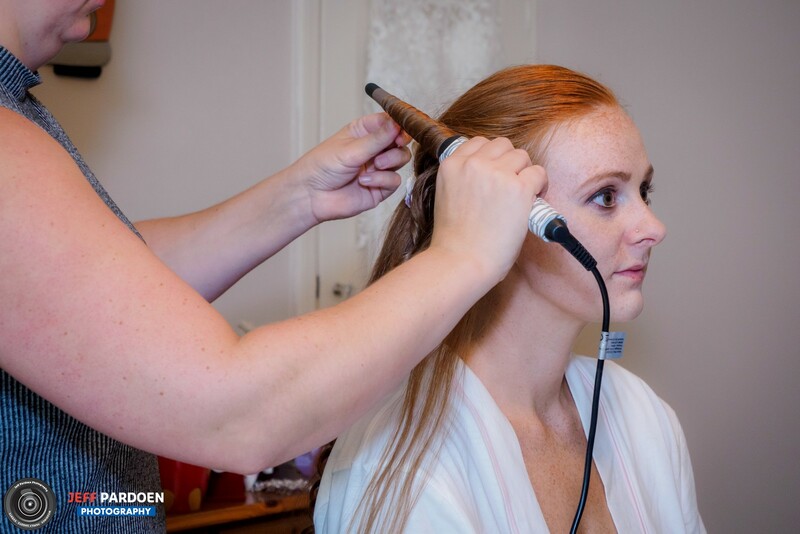 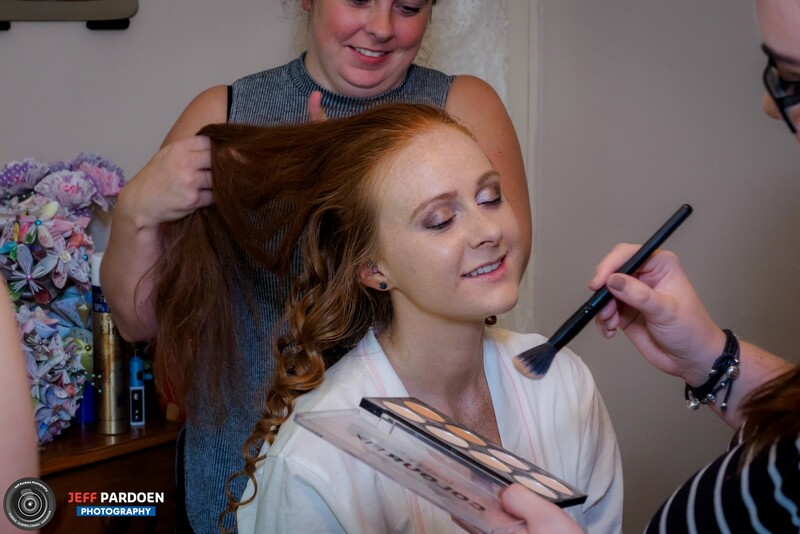 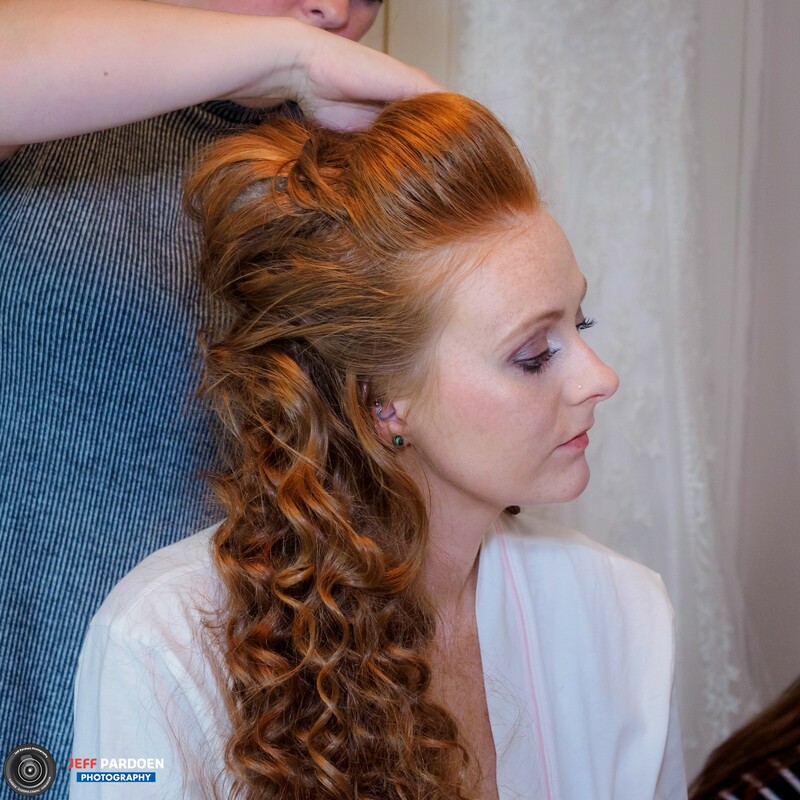 It was an all day shoot so naturally it began with the bridal preparations. 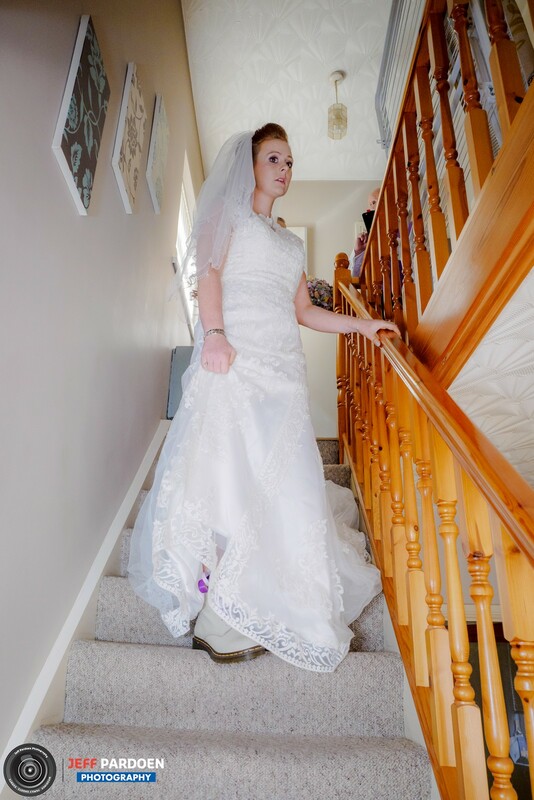 I was at the bride’s parents house at 10:00 to begin the day. 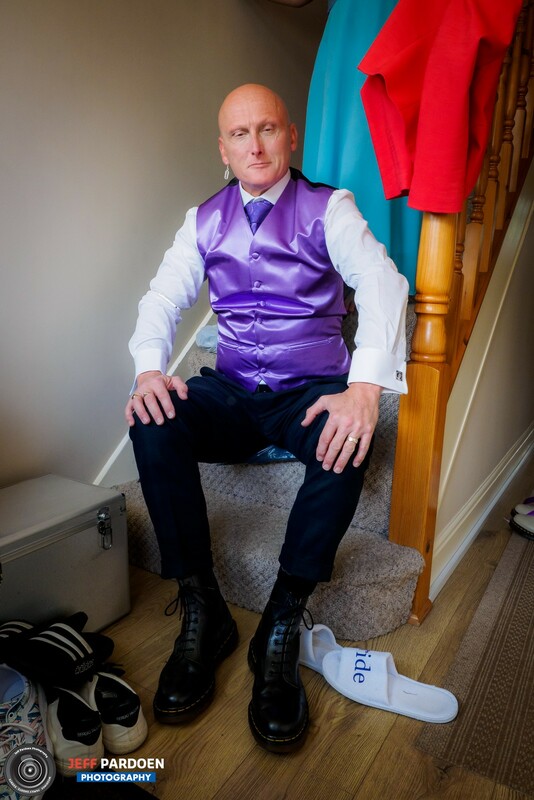 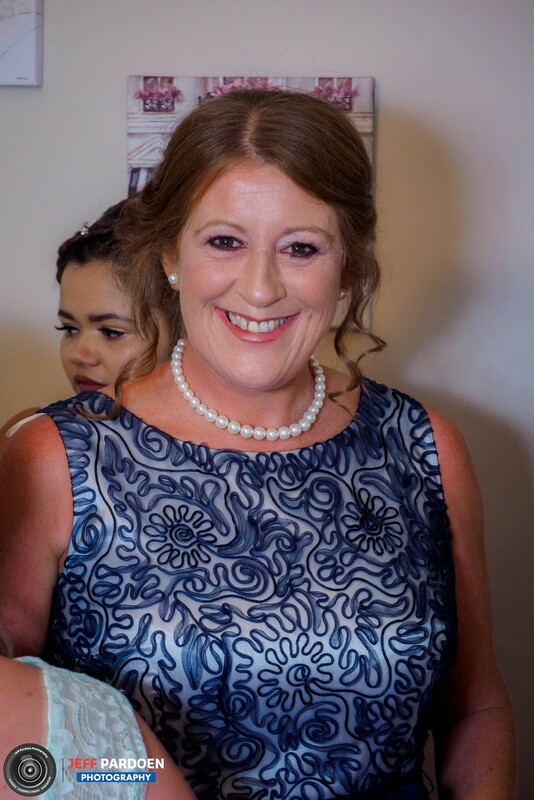 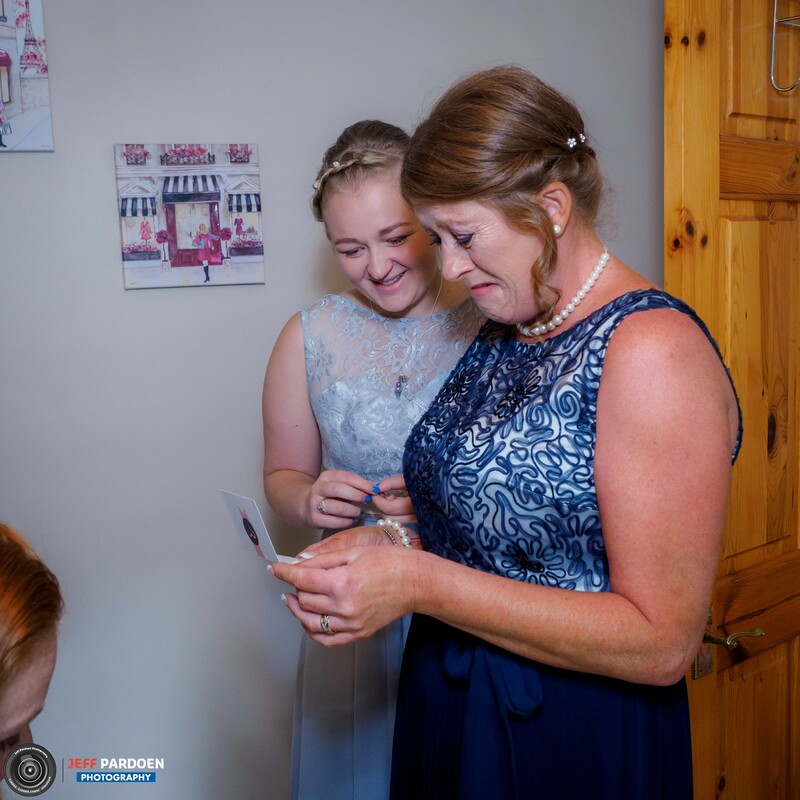 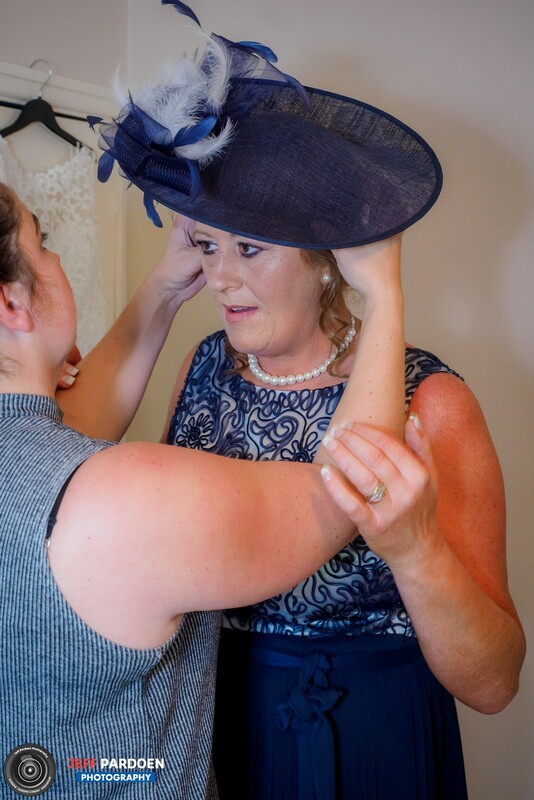 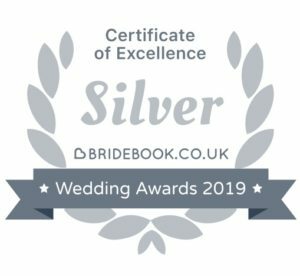 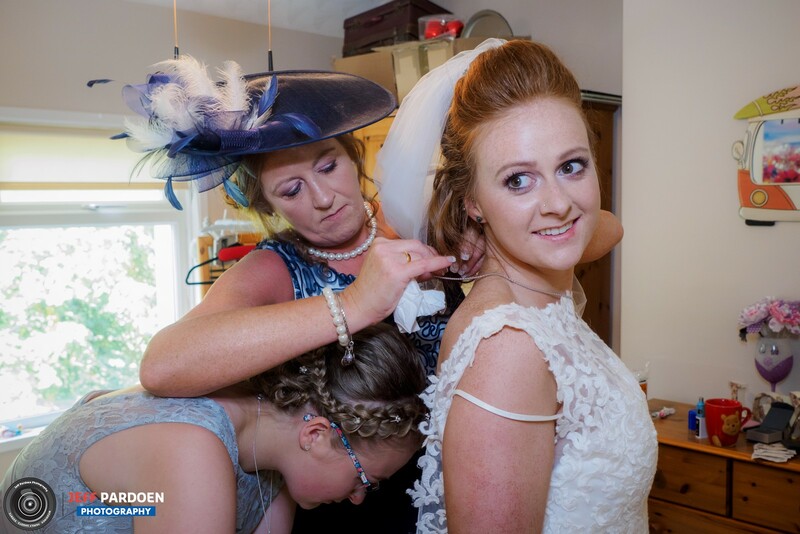 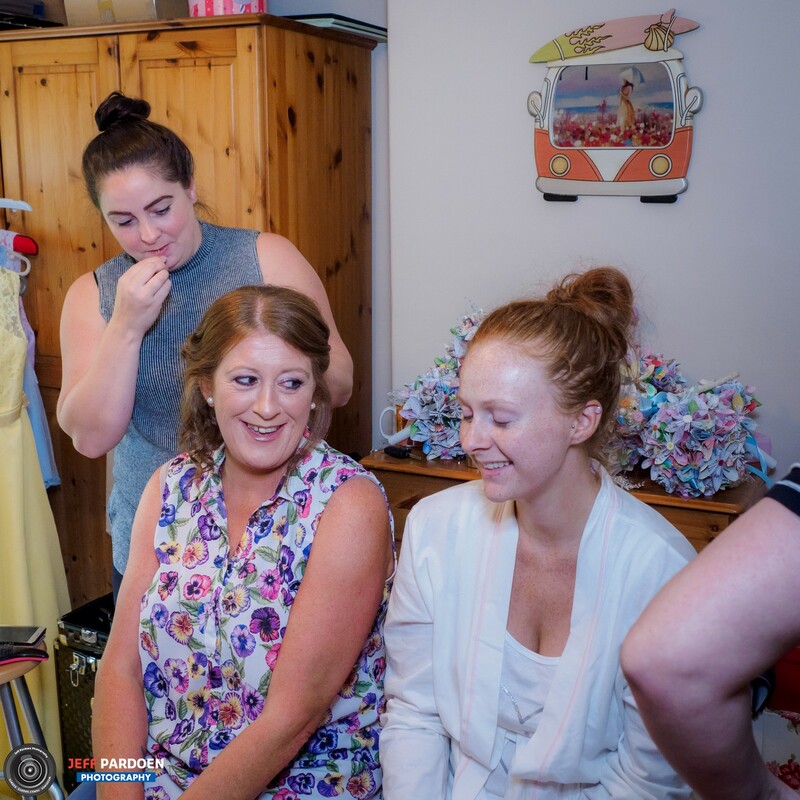 As usual there was a flurry of activity going on, Bride, Bridesmaids, Maid of Honour and Mum and Dad roaming around the house and me bobbing and weaving through it all. 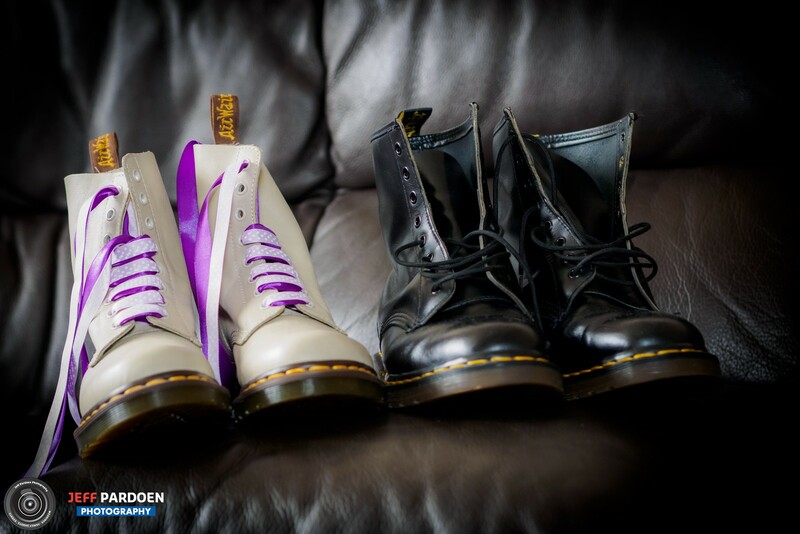 Laura and her father would both be wearing Doc Martins, a nice touch. 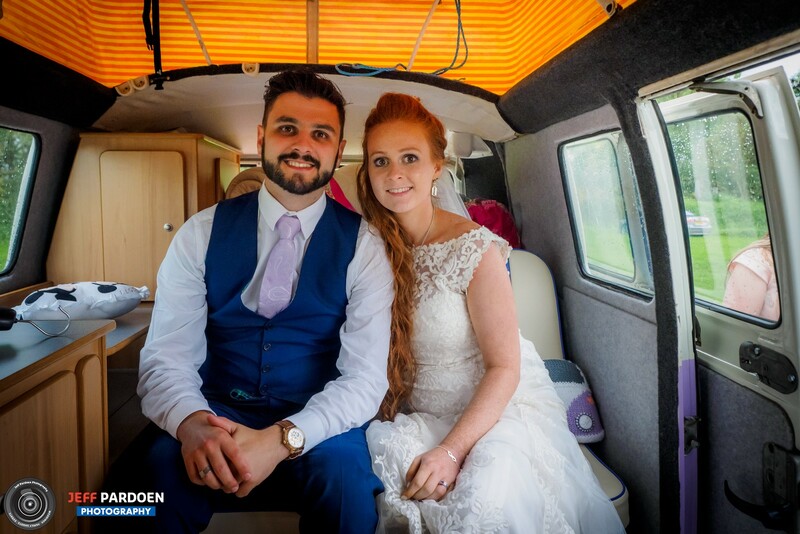 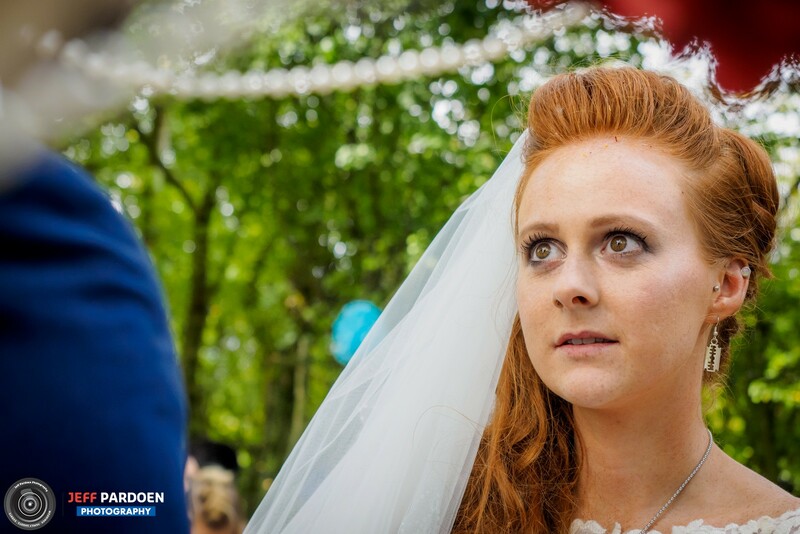 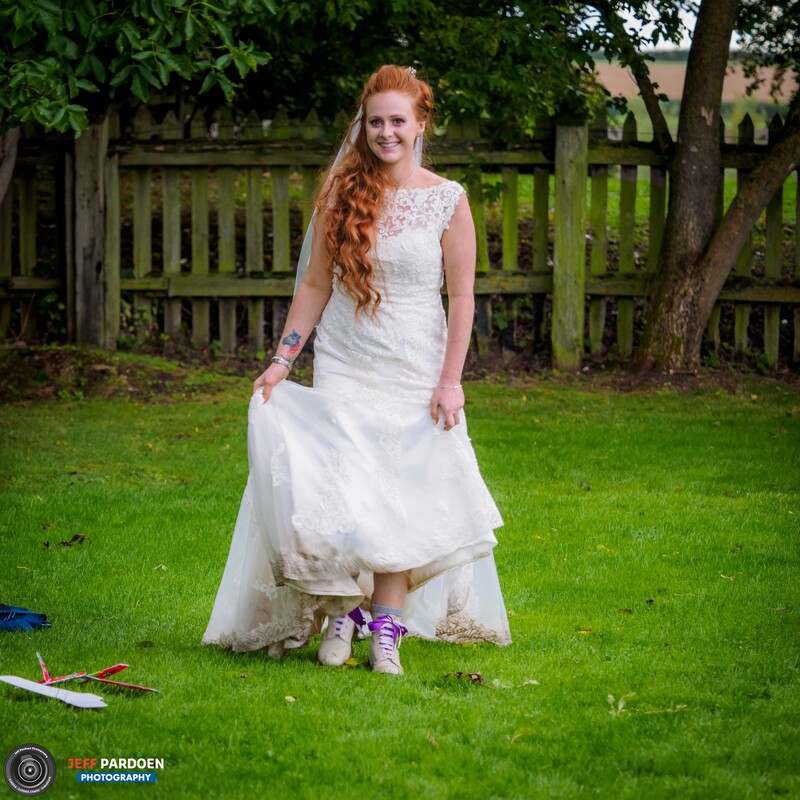 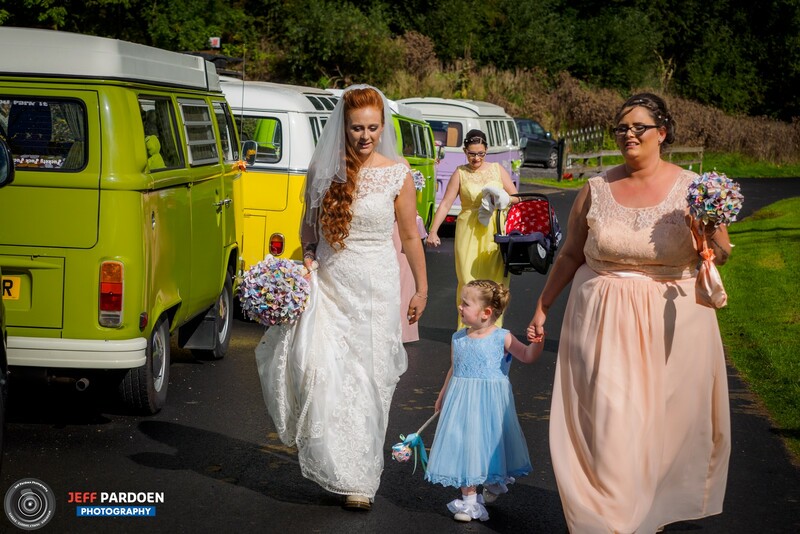 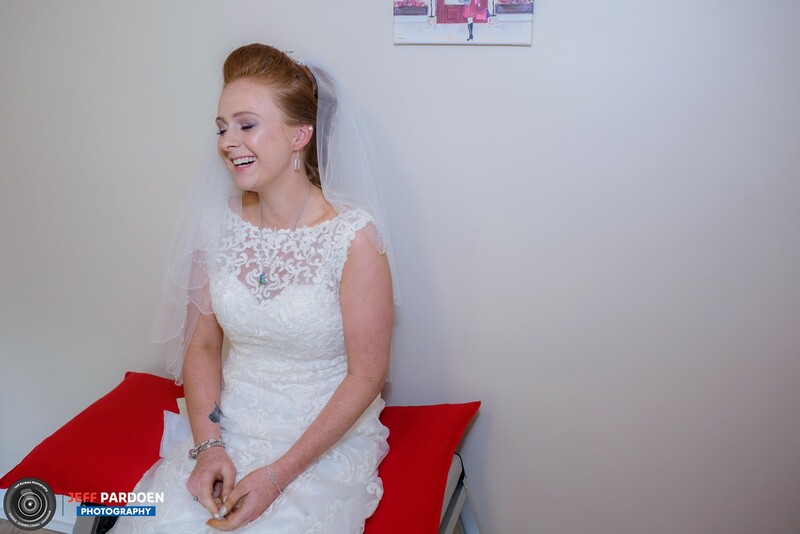 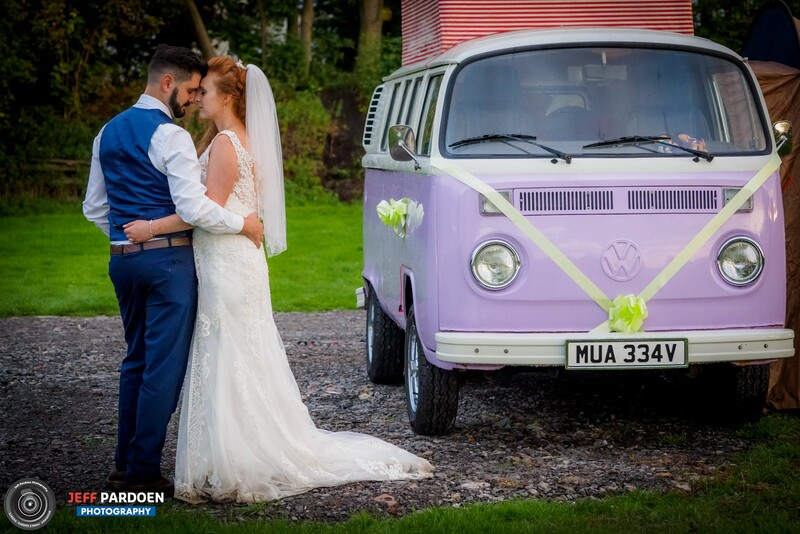 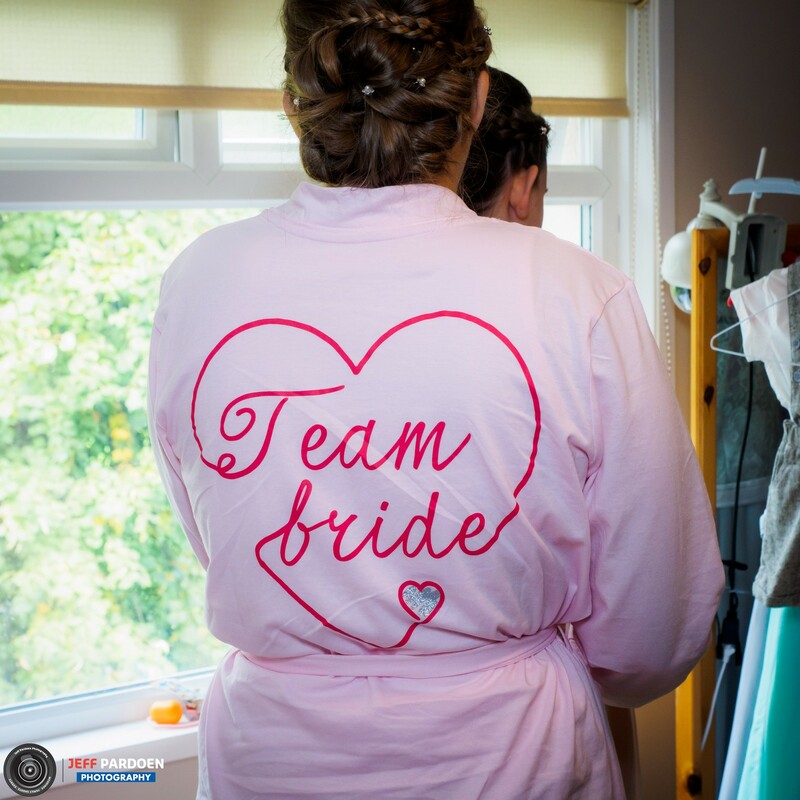 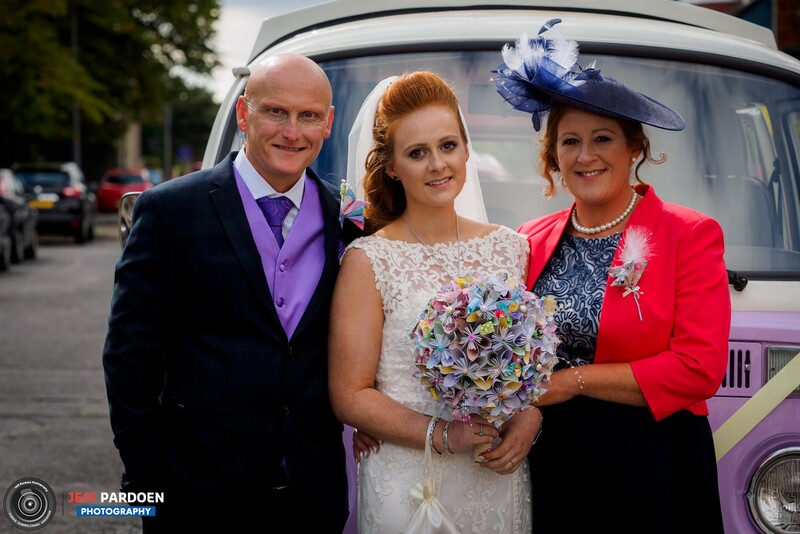 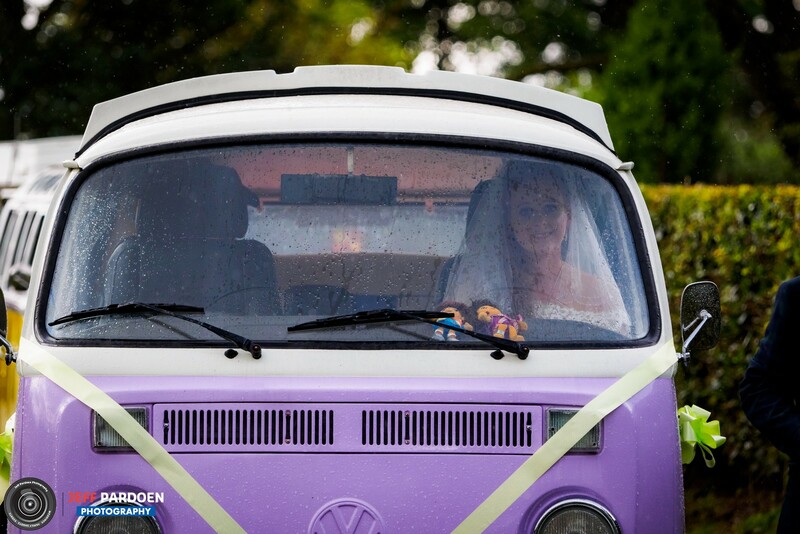 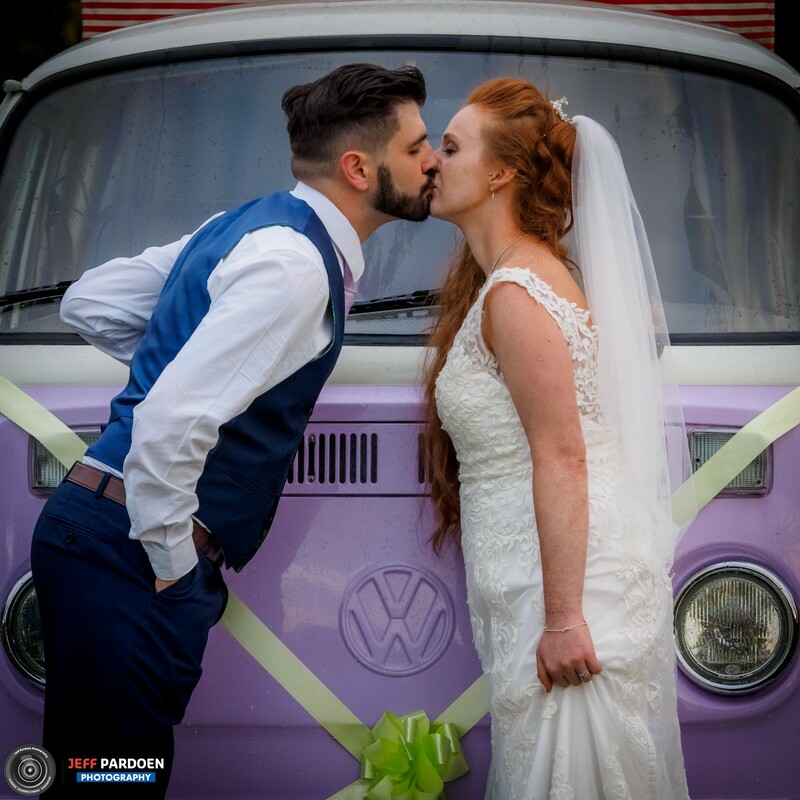 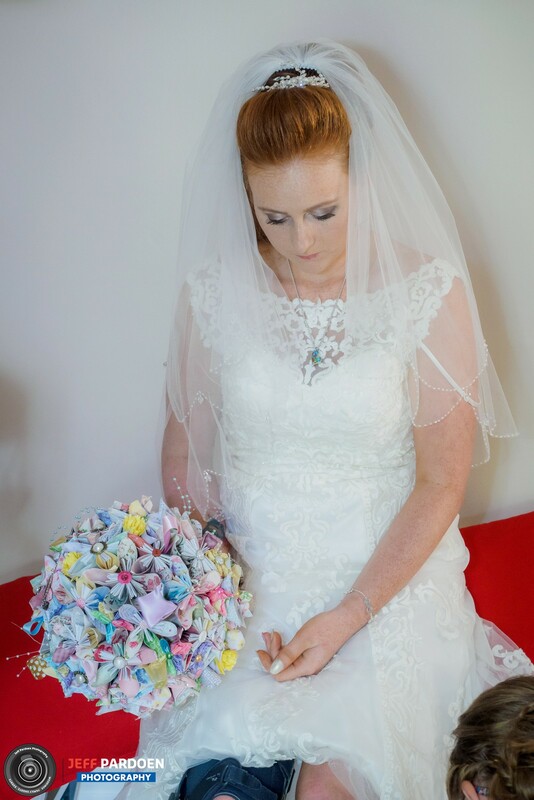 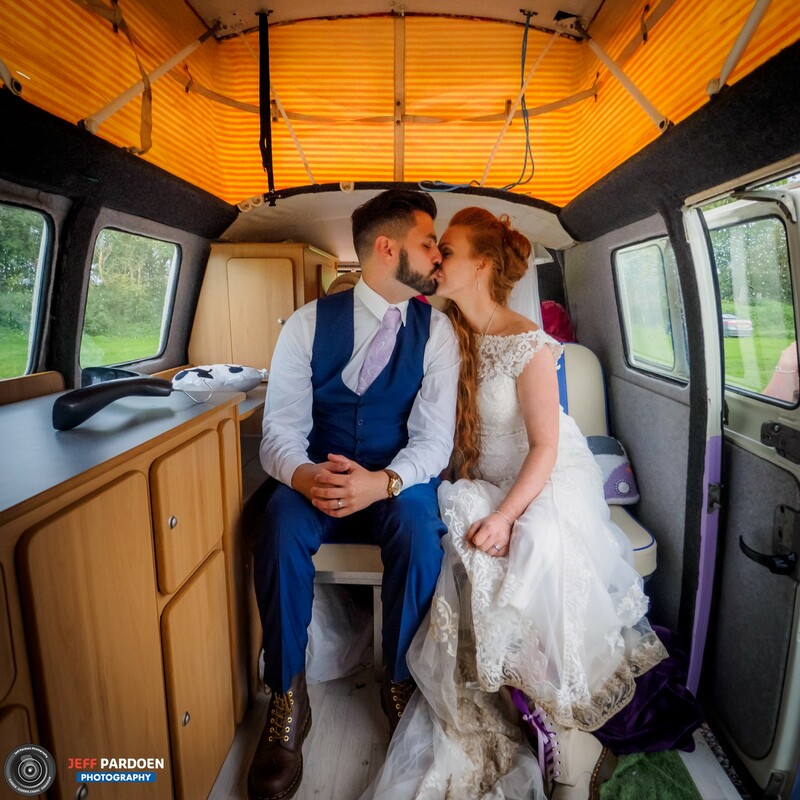 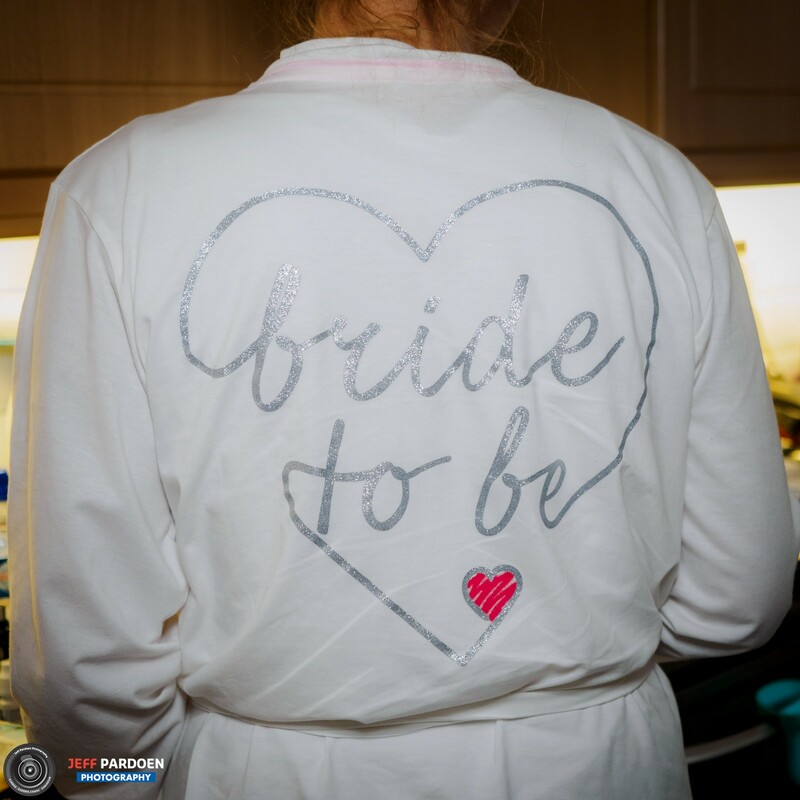 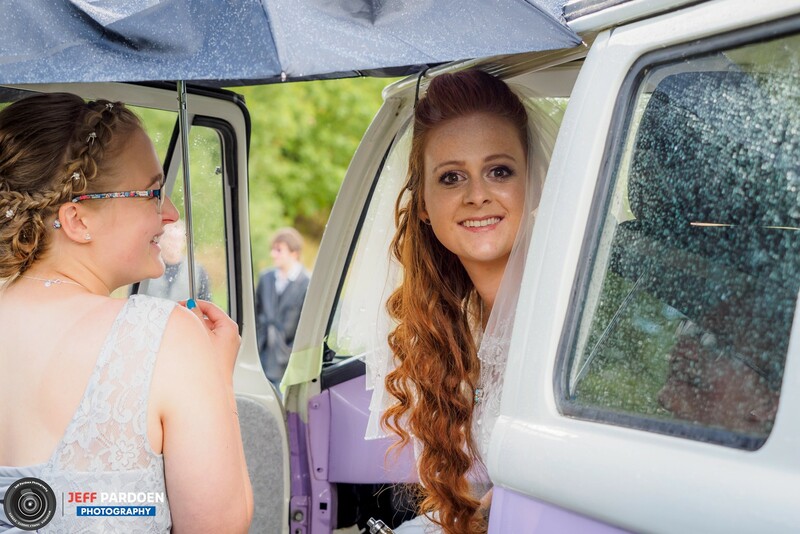 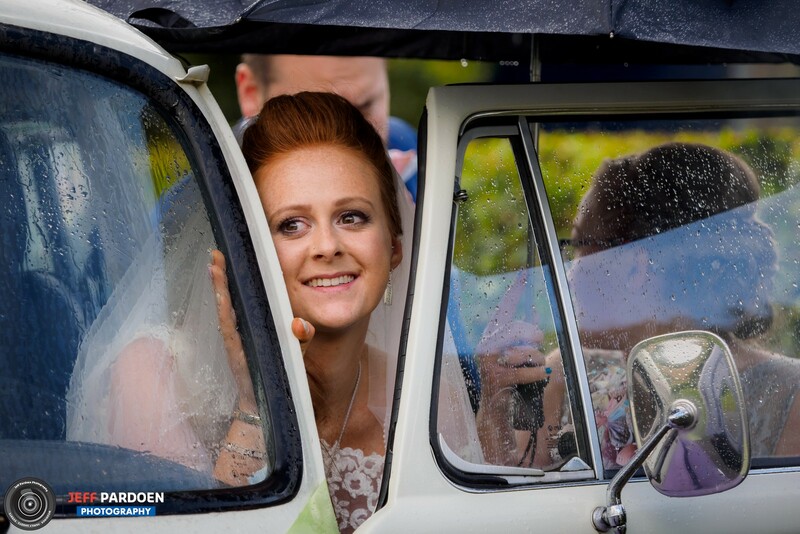 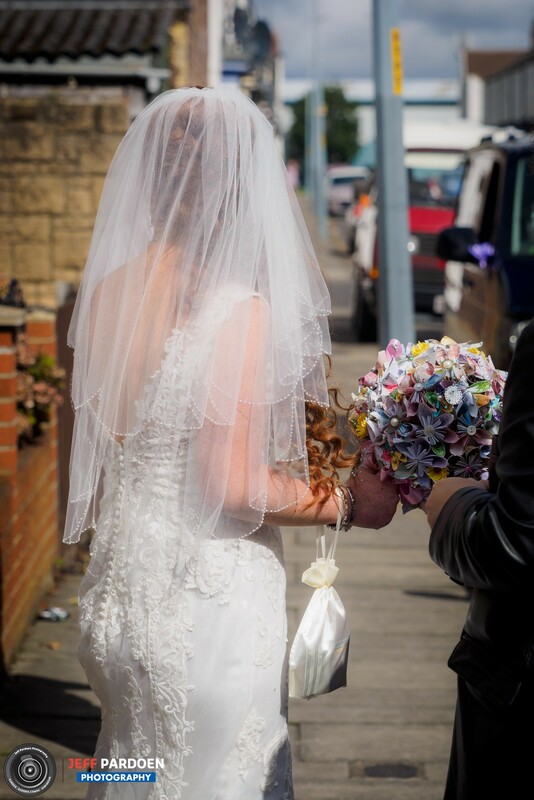 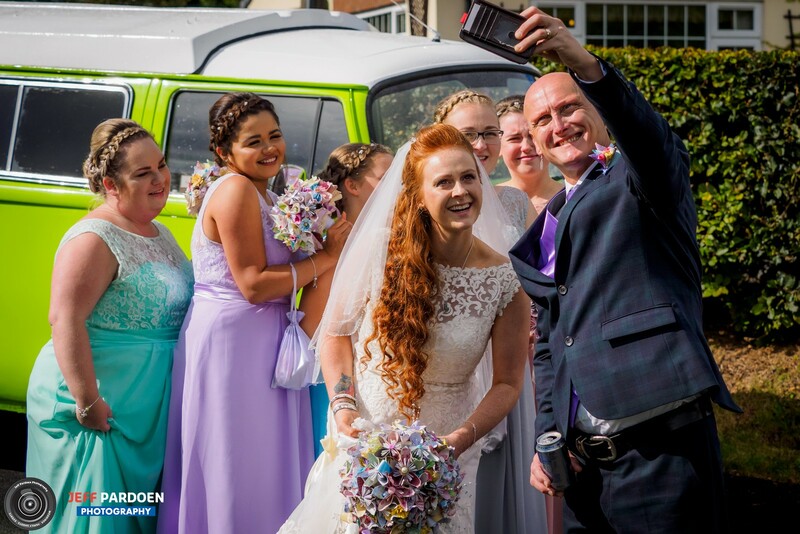 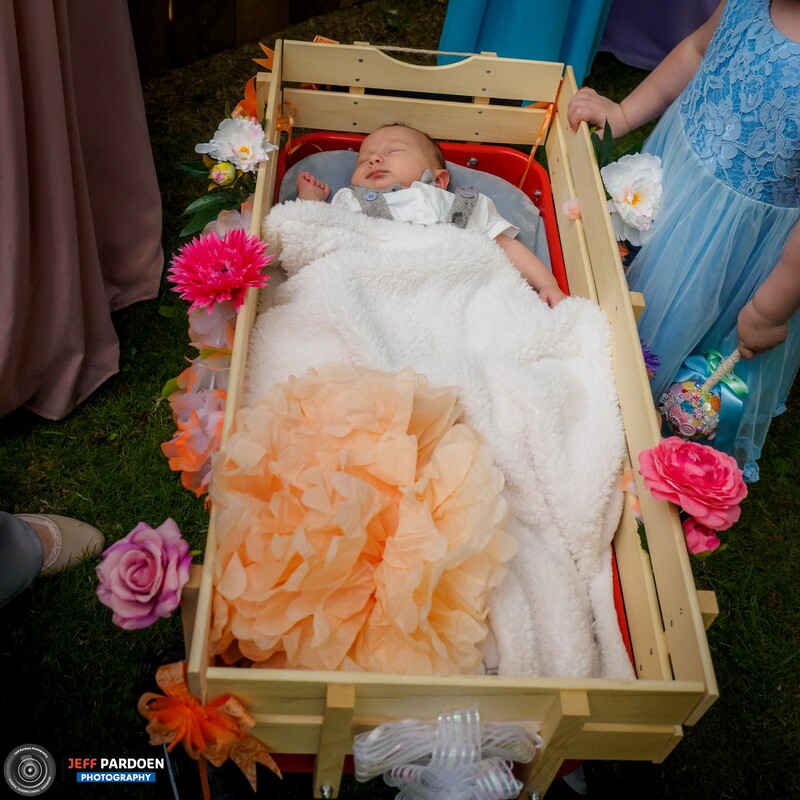 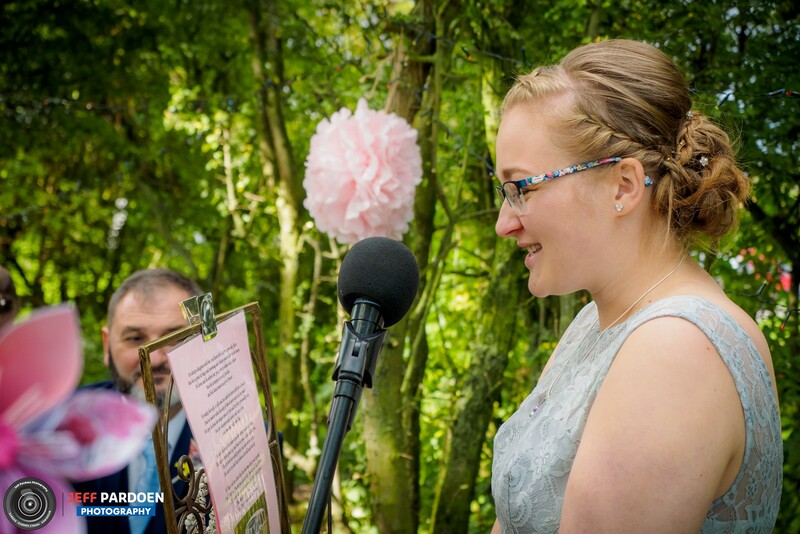 The bride to be also went outside to decorate her Volkswagen T2 van which has been in her family for 23 years and is called Lily. 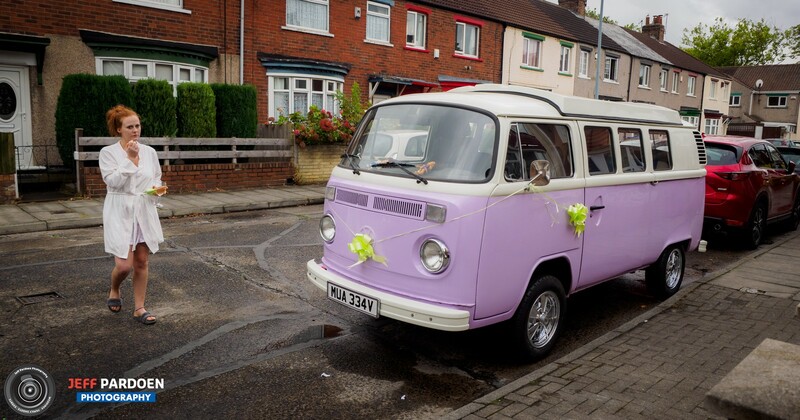 I love T2’s or Kombi as I know them from my youth, they are a true classic. 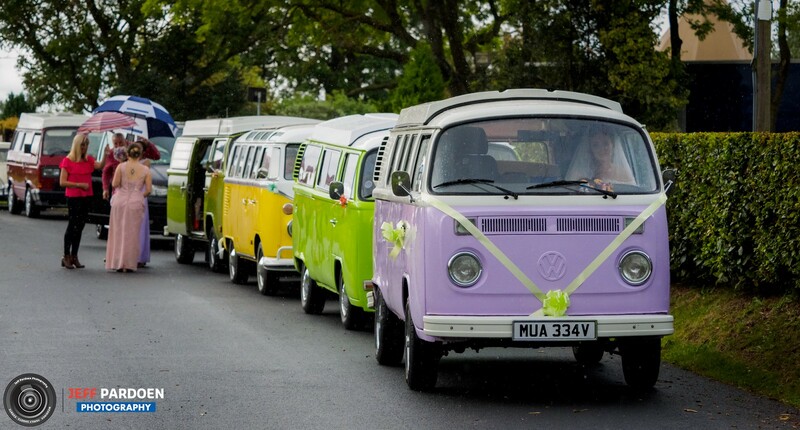 A convoy of Volkswagens of all sorts was due to accompany her to the venue later on. 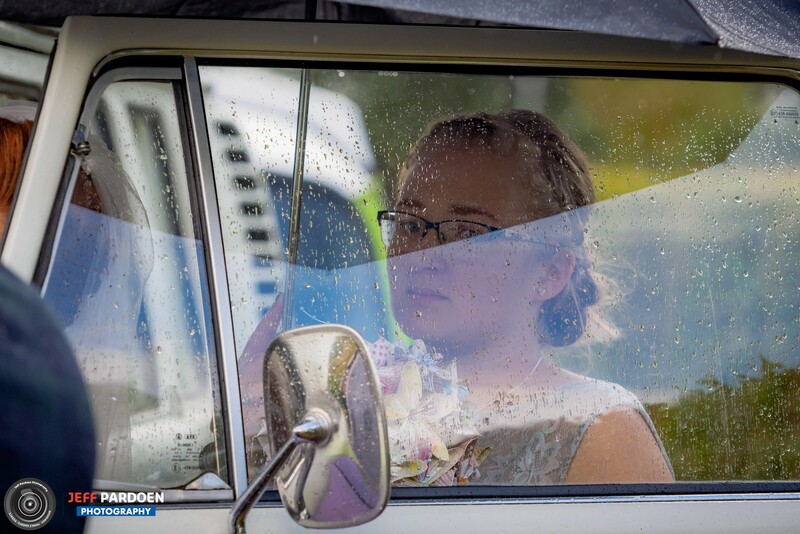 After the preparations I quickly went to the venue to meet up with Lyle and await the arrival of the convoy at which point it started to rain. 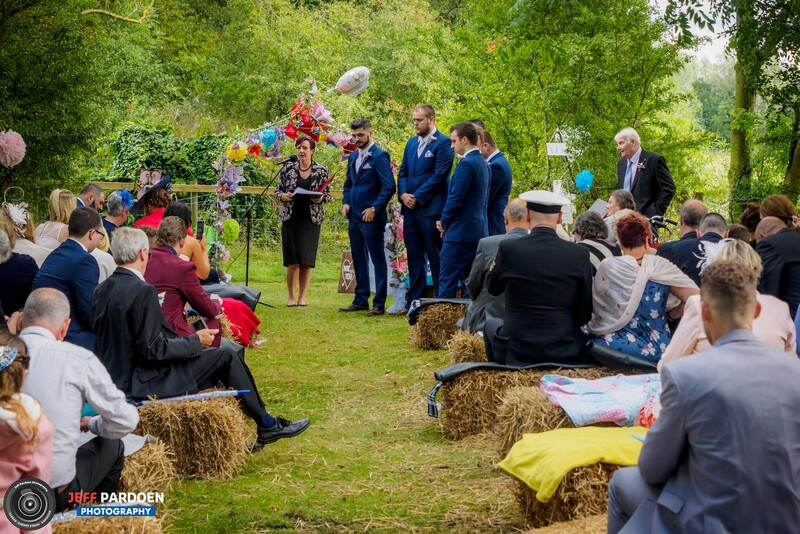 The ceremony was supposed to take place outside and it looked as if it had to be moved inside. 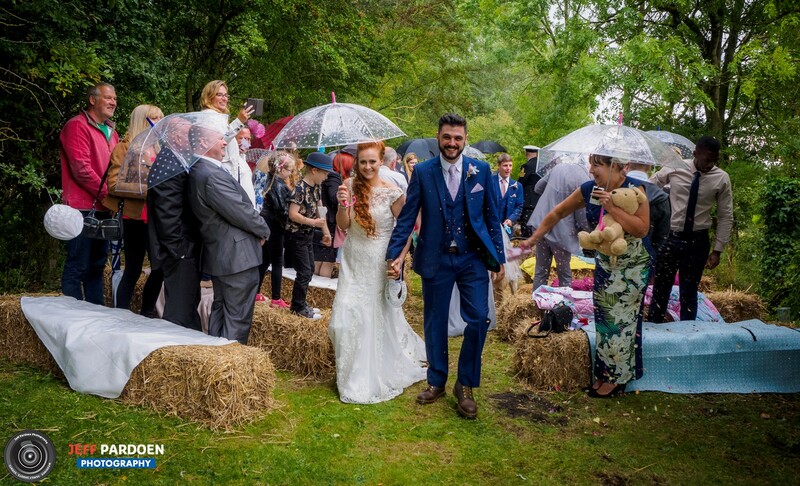 Luckily the rain subsided and the ceremony went ahead outside. 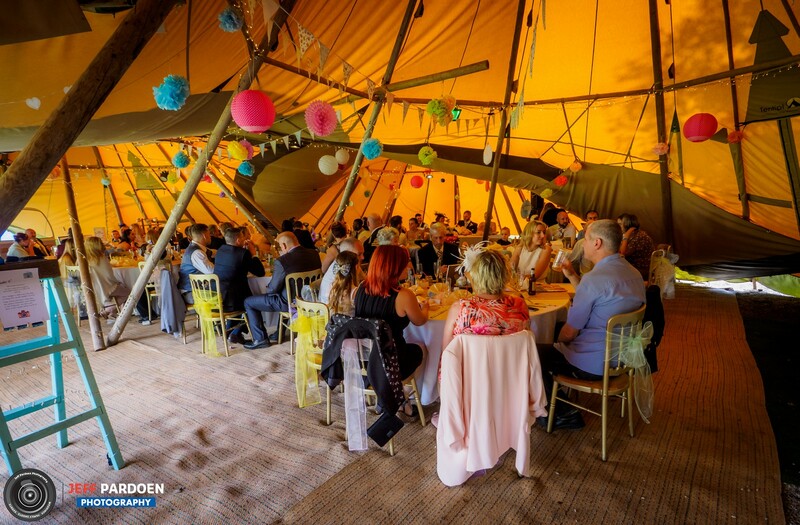 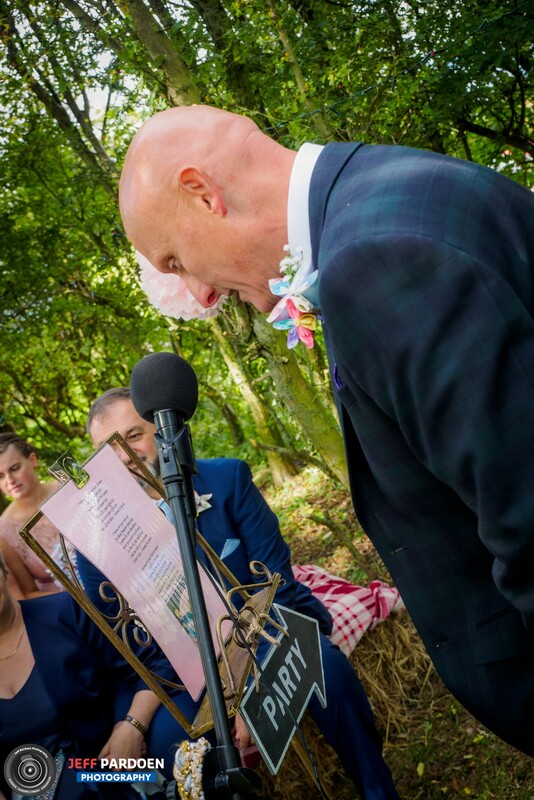 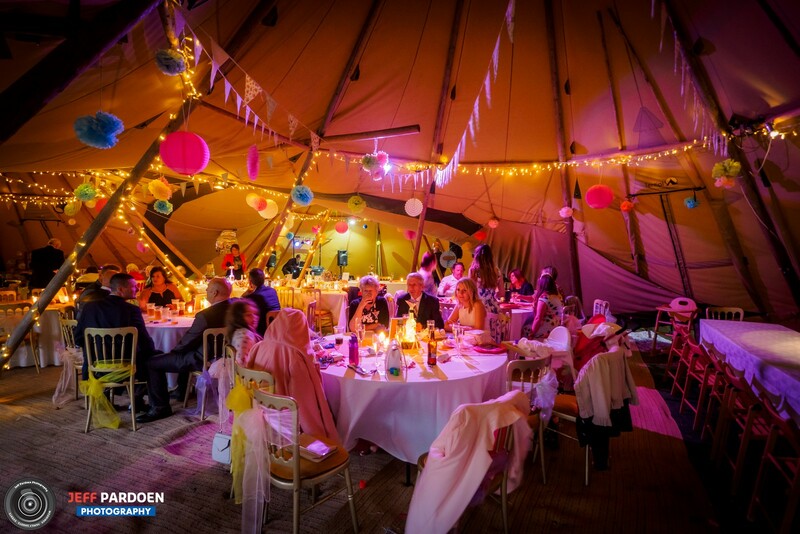 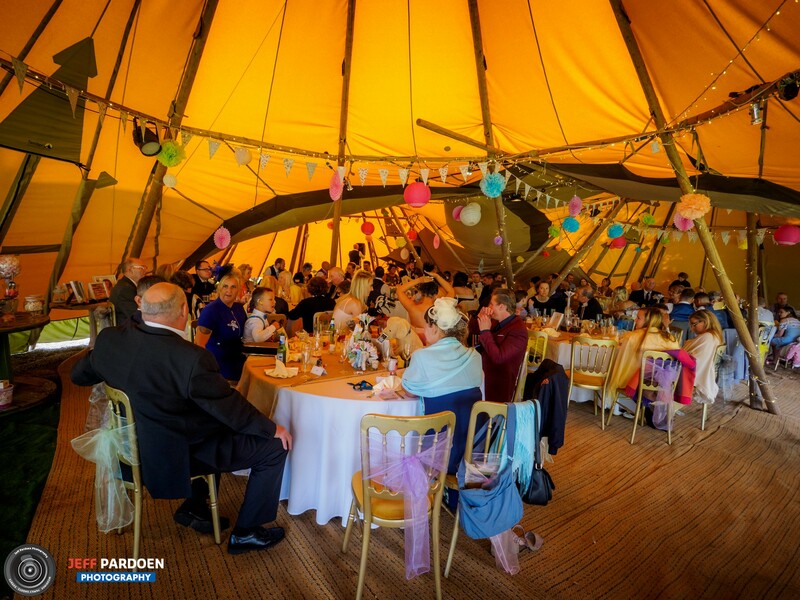 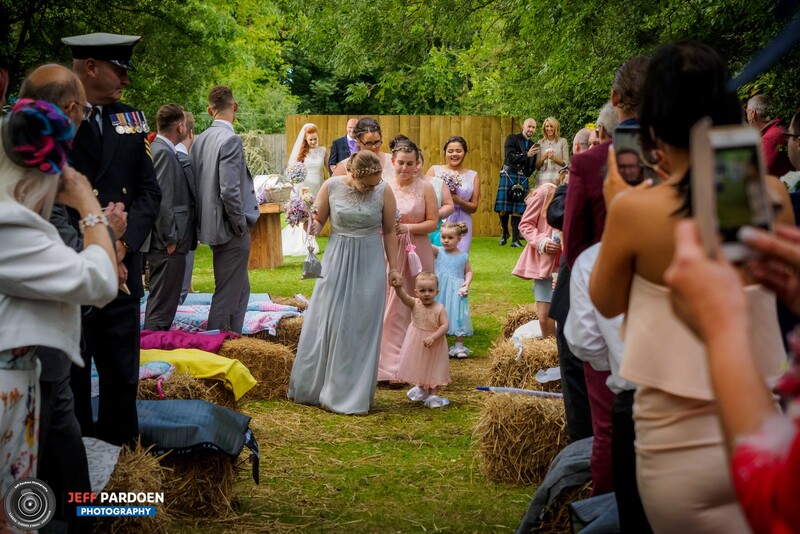 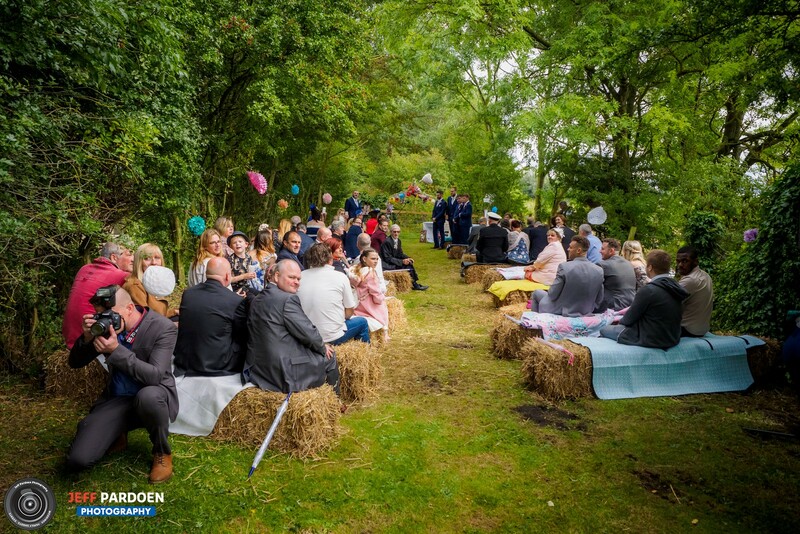 The guests were seated on straw bales on either side of the grass aisle and it was the loveliest setting. 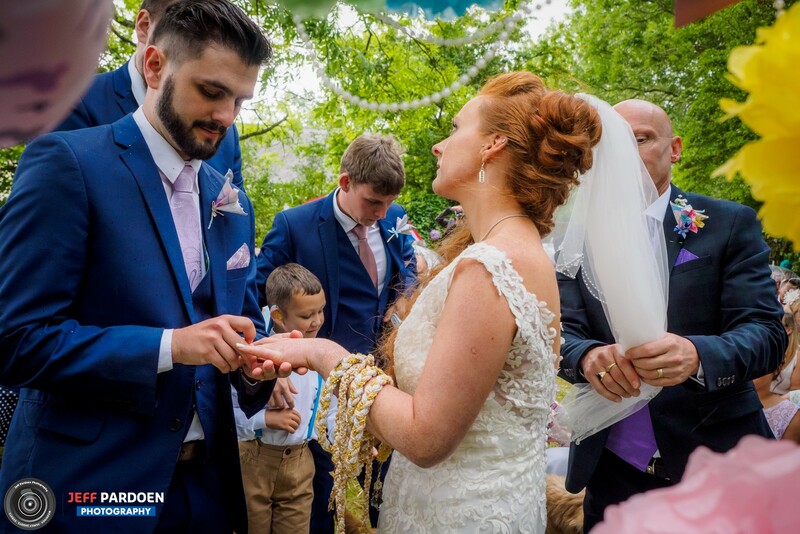 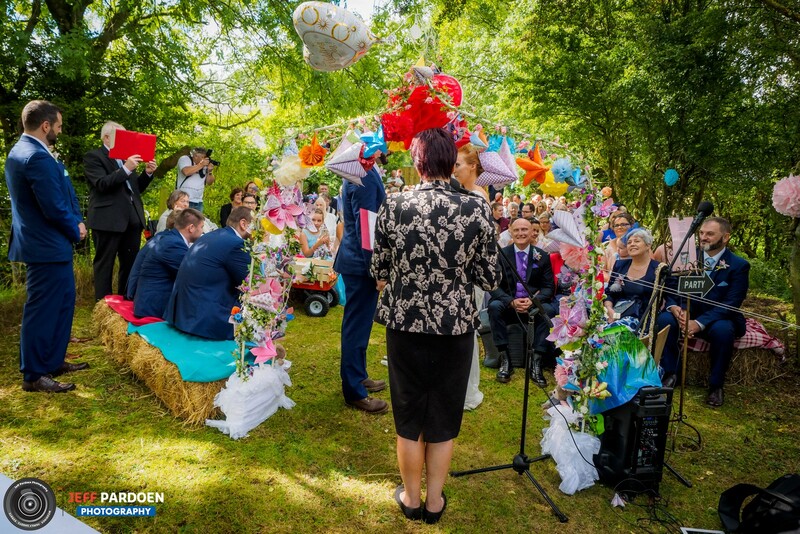 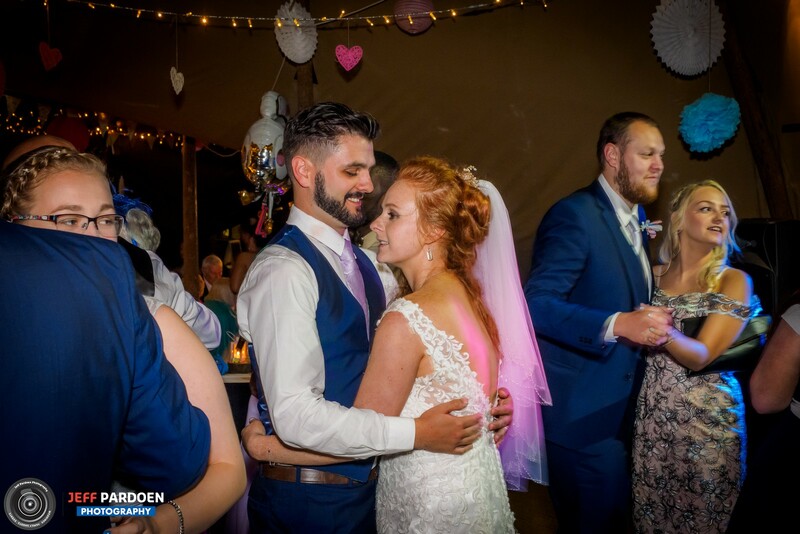 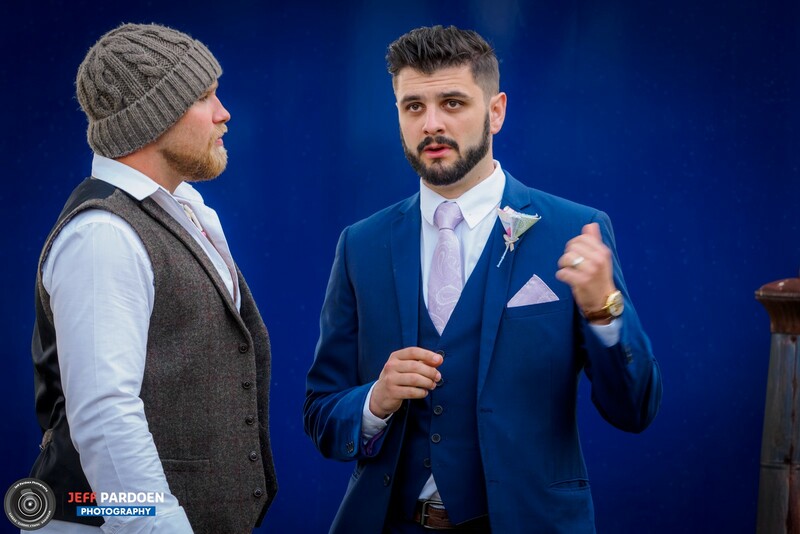 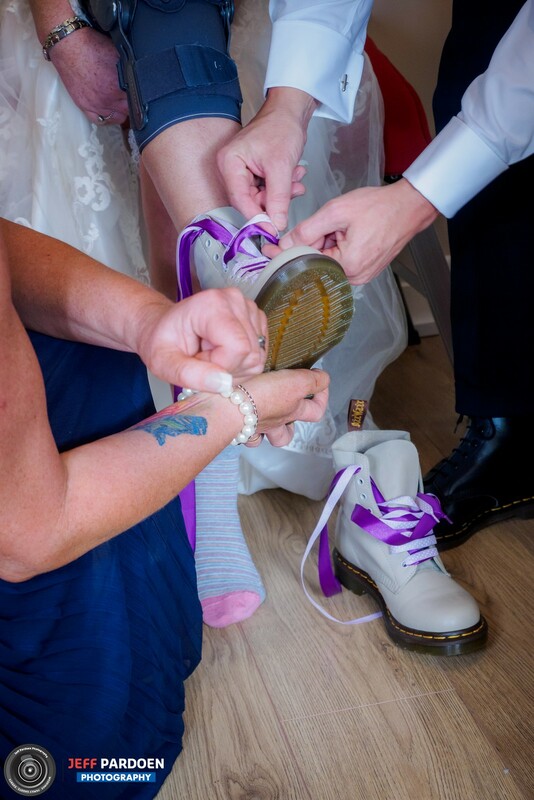 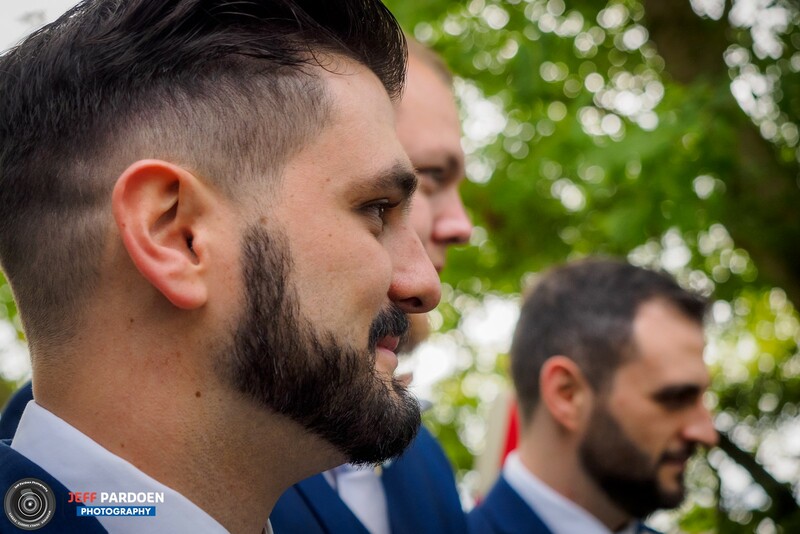 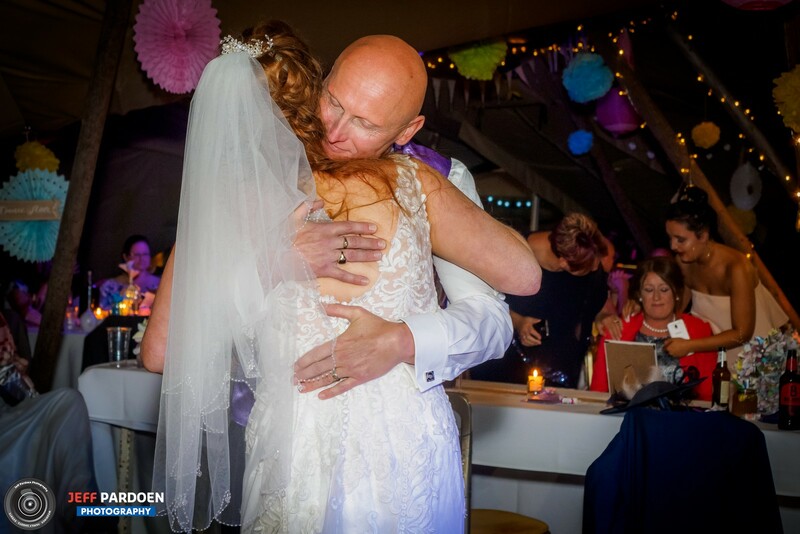 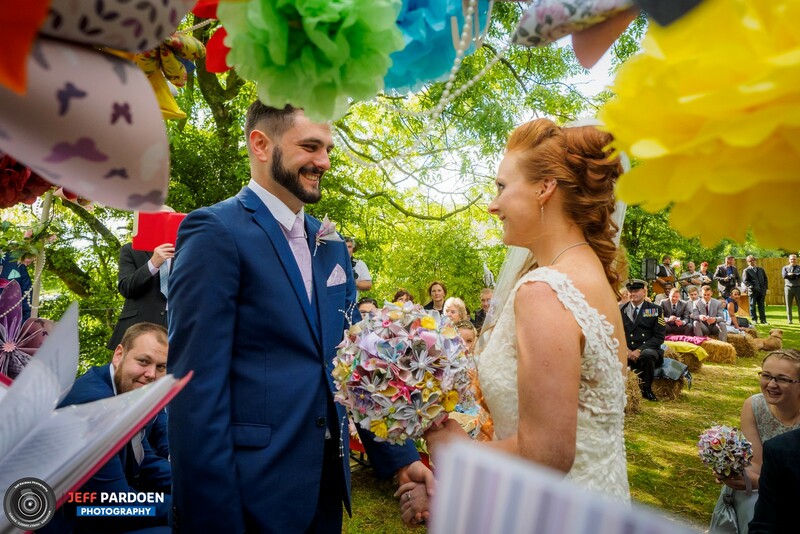 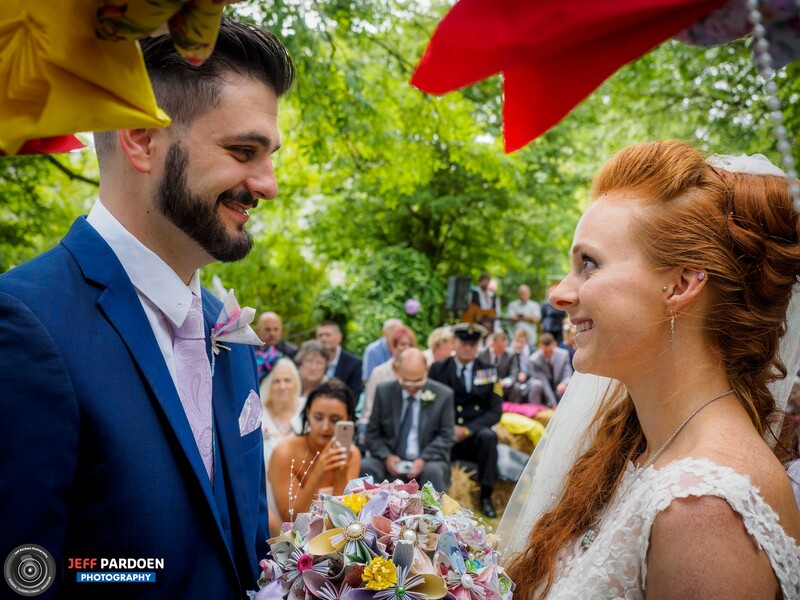 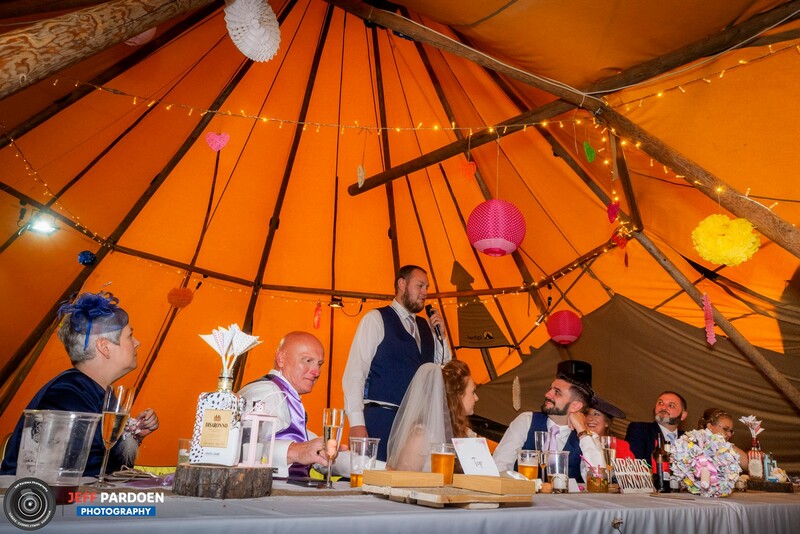 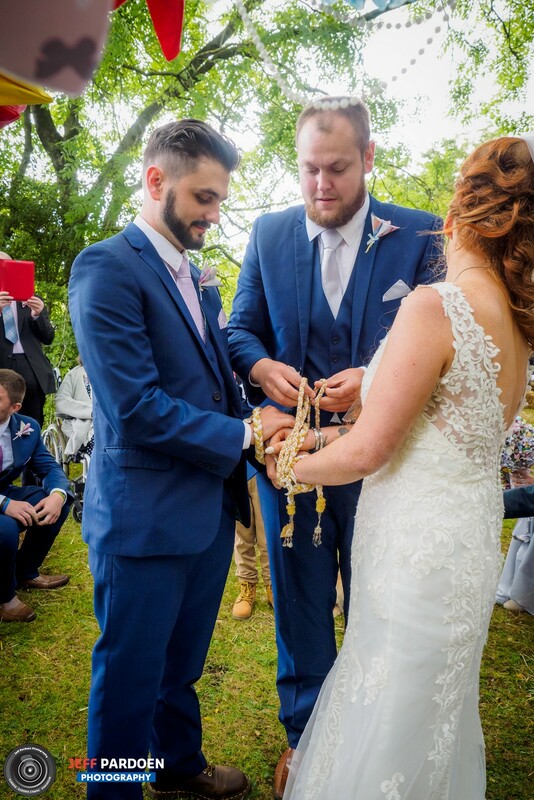 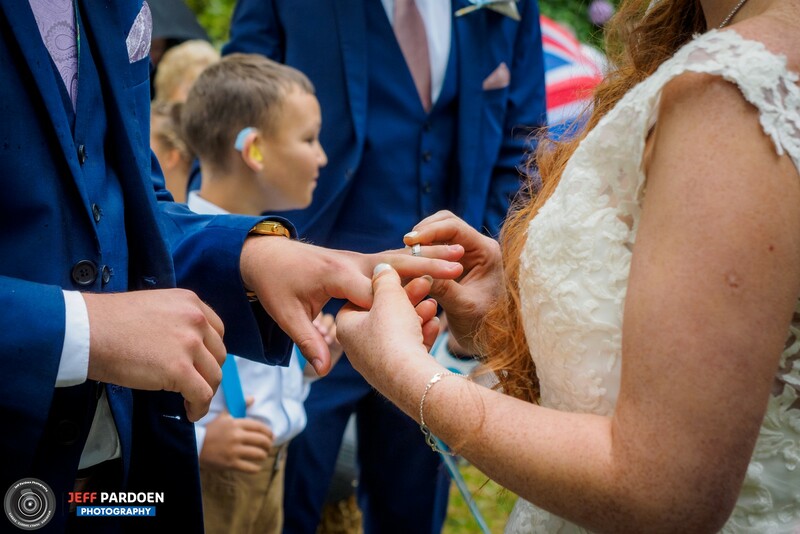 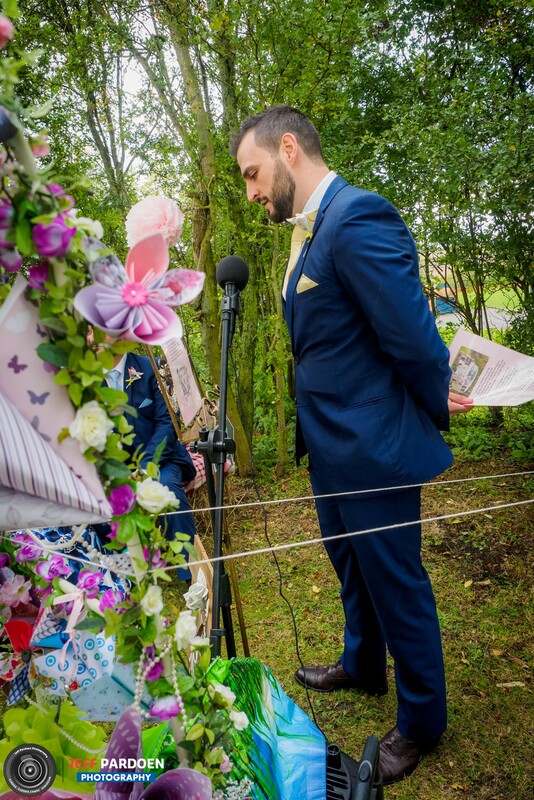 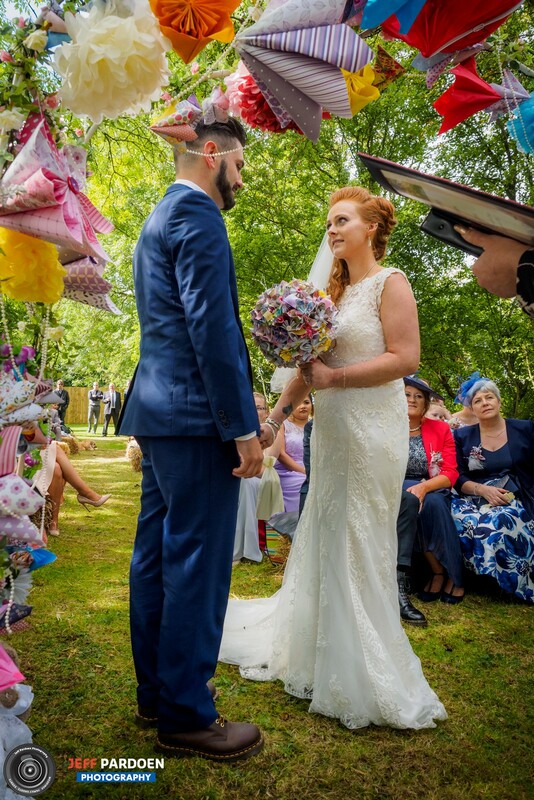 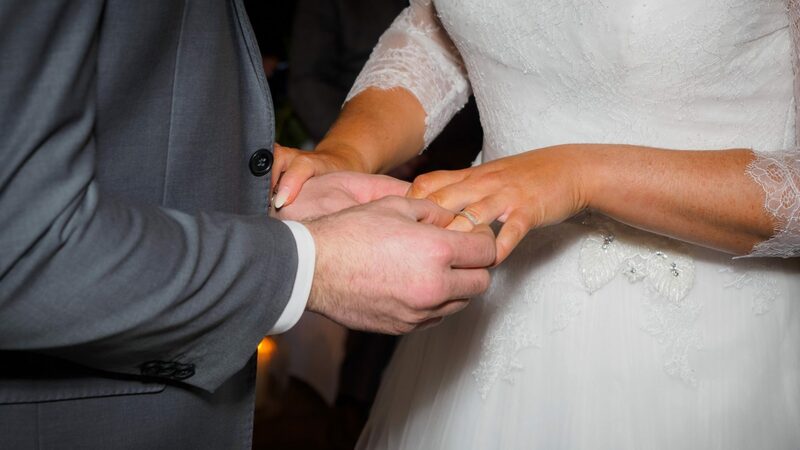 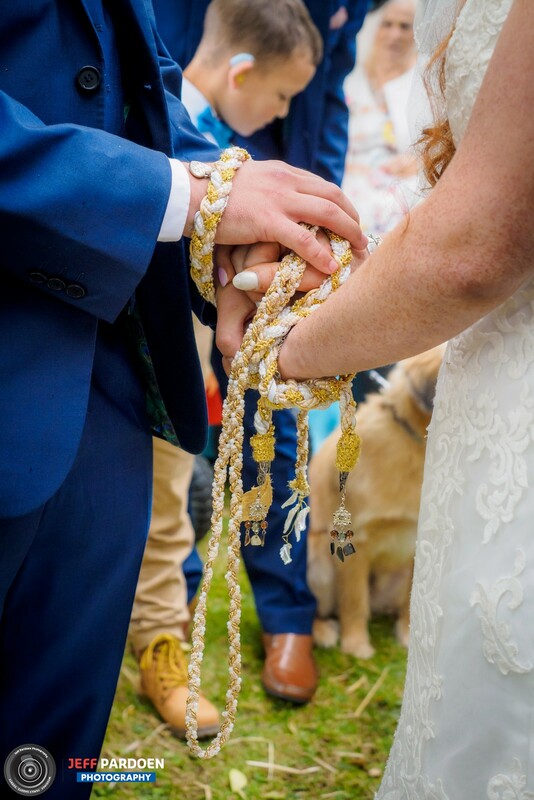 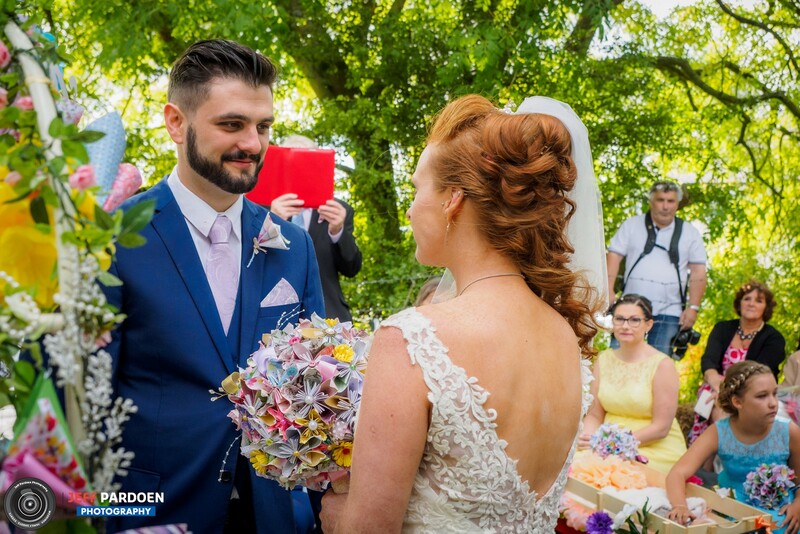 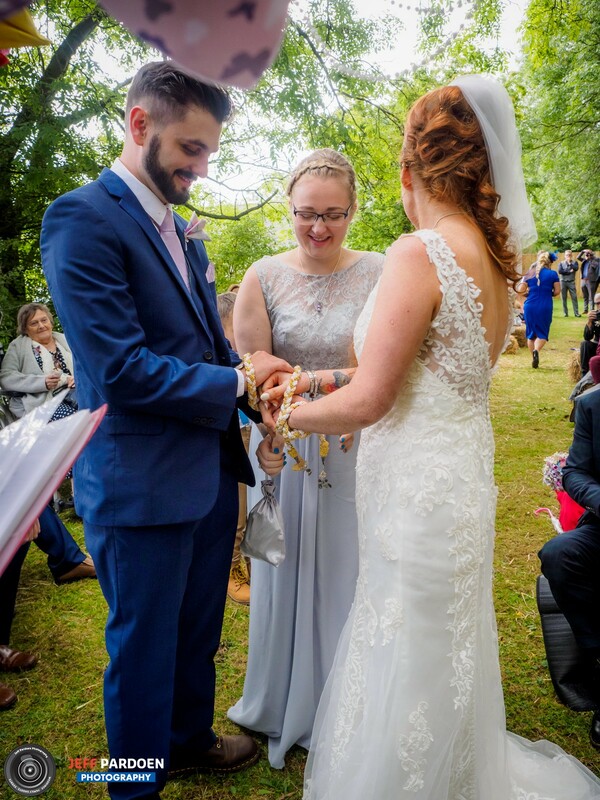 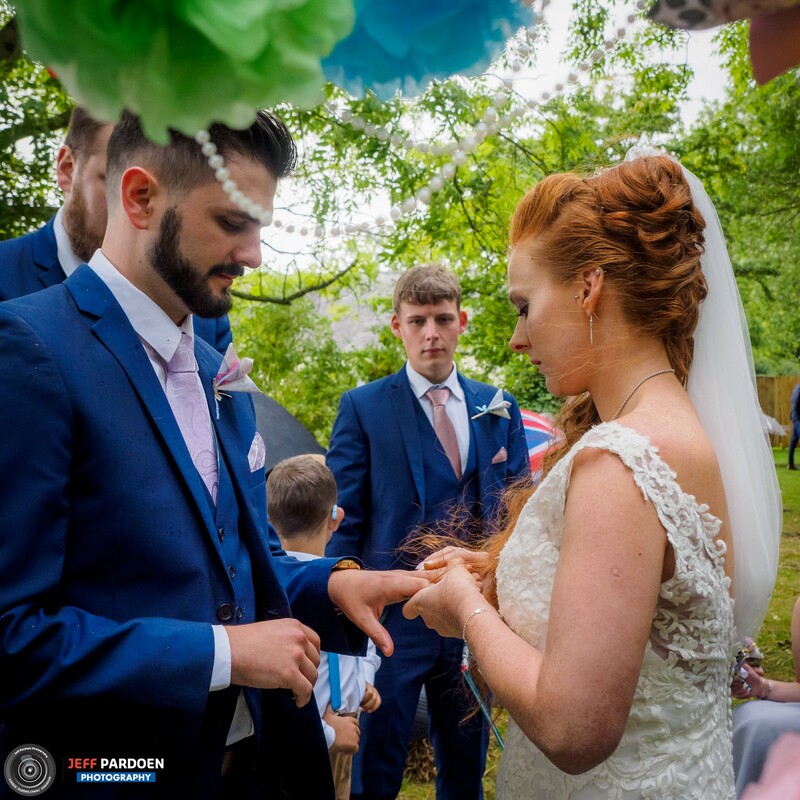 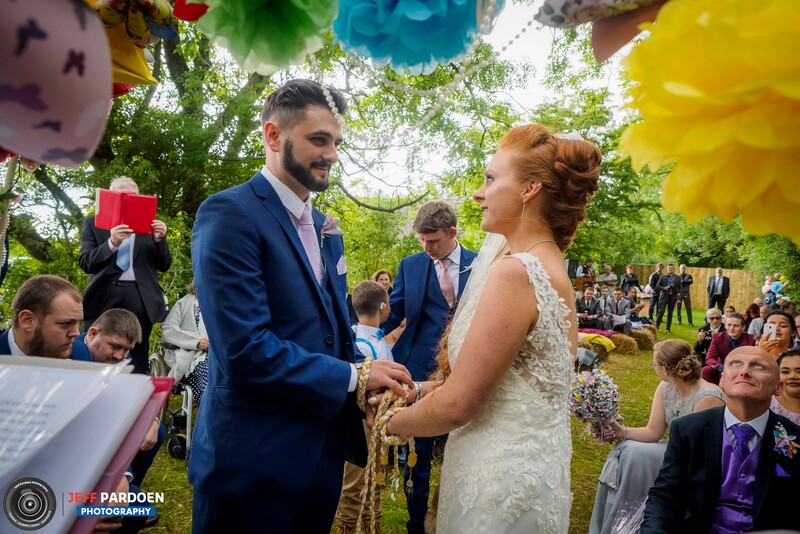 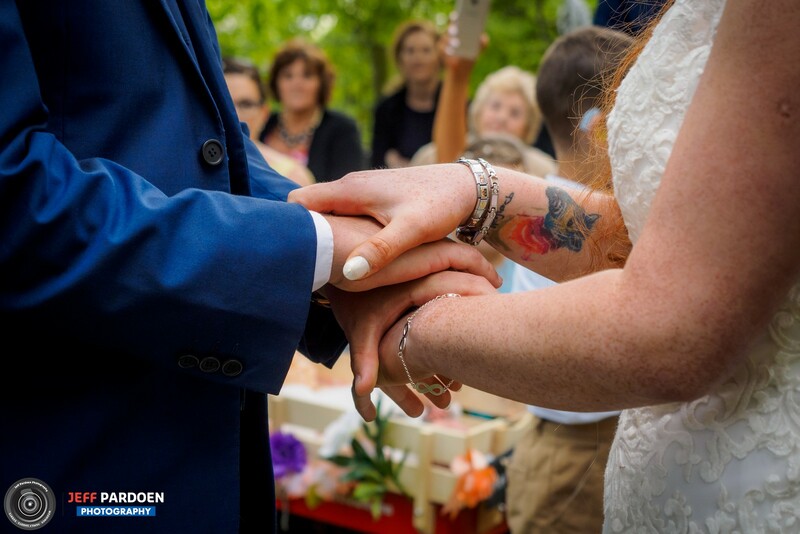 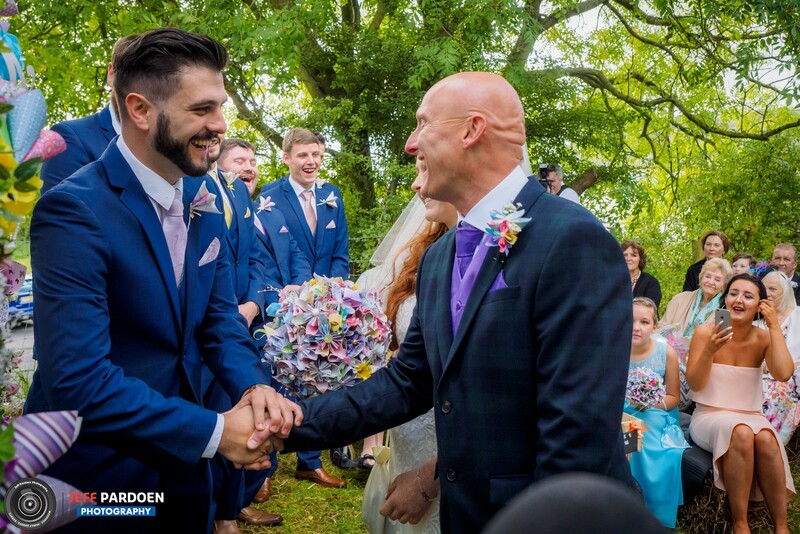 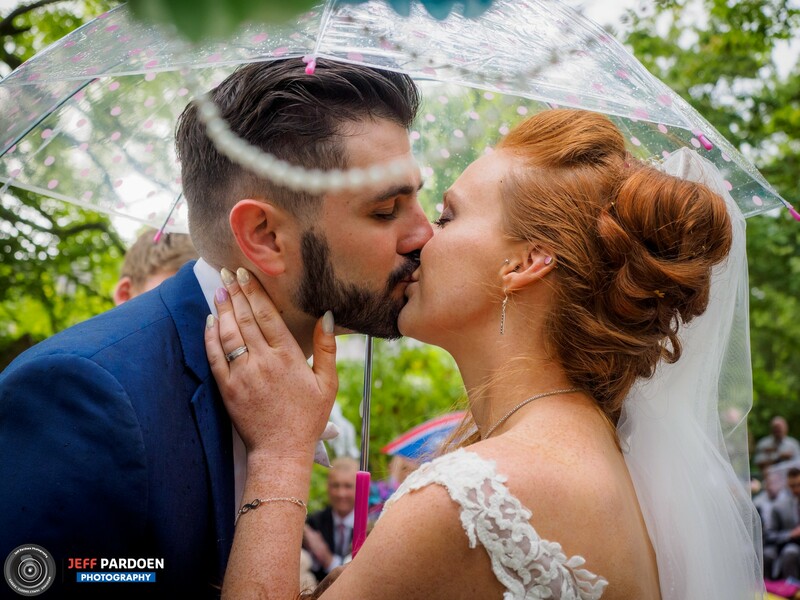 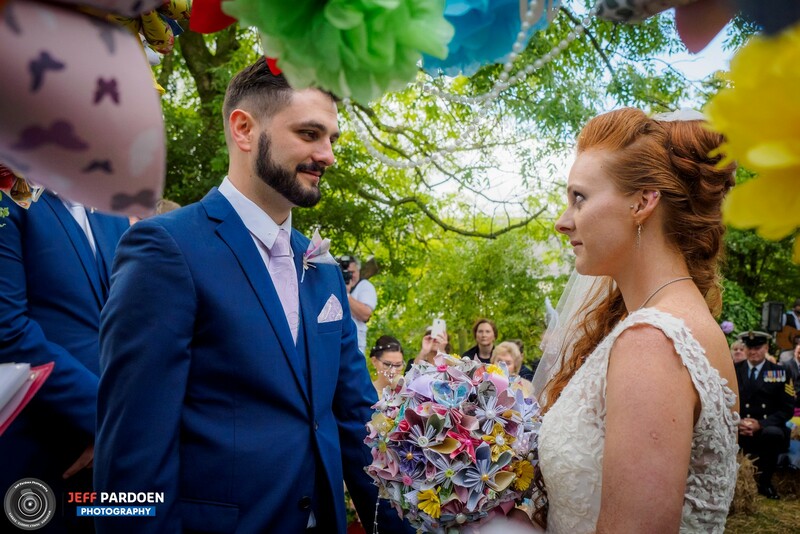 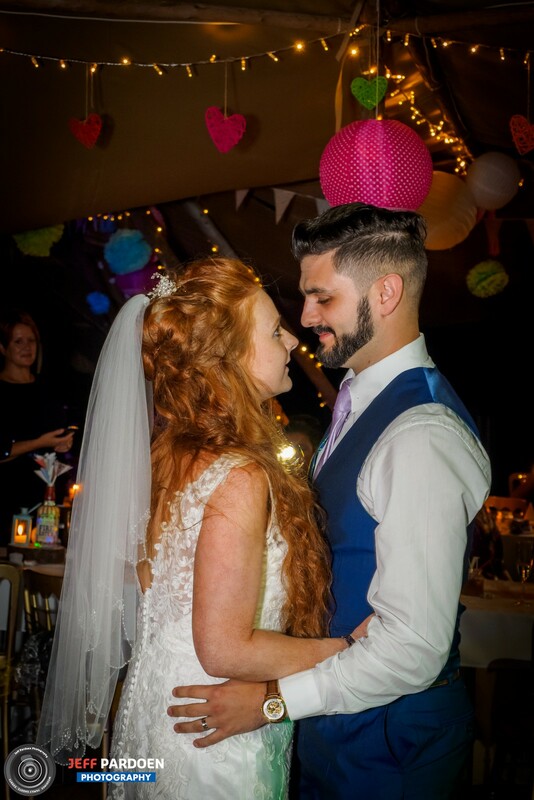 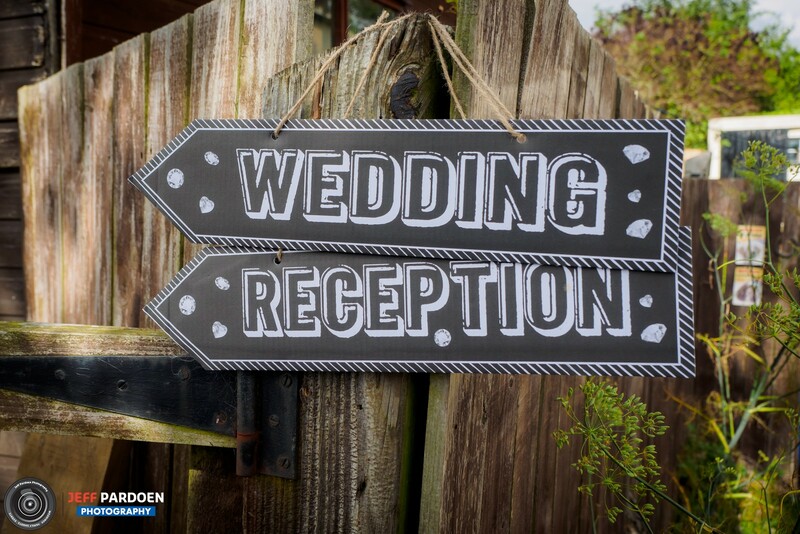 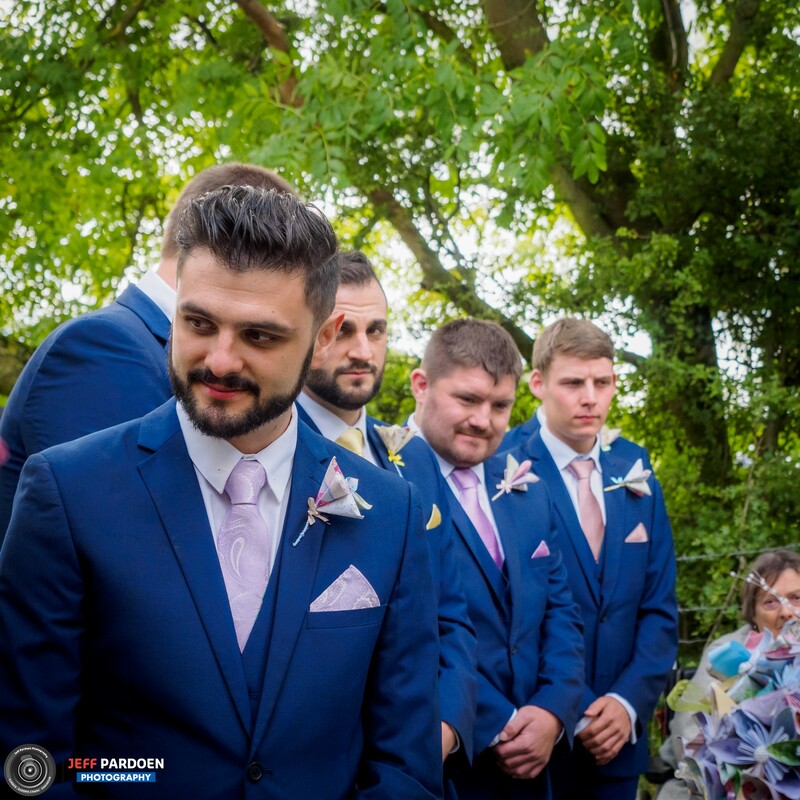 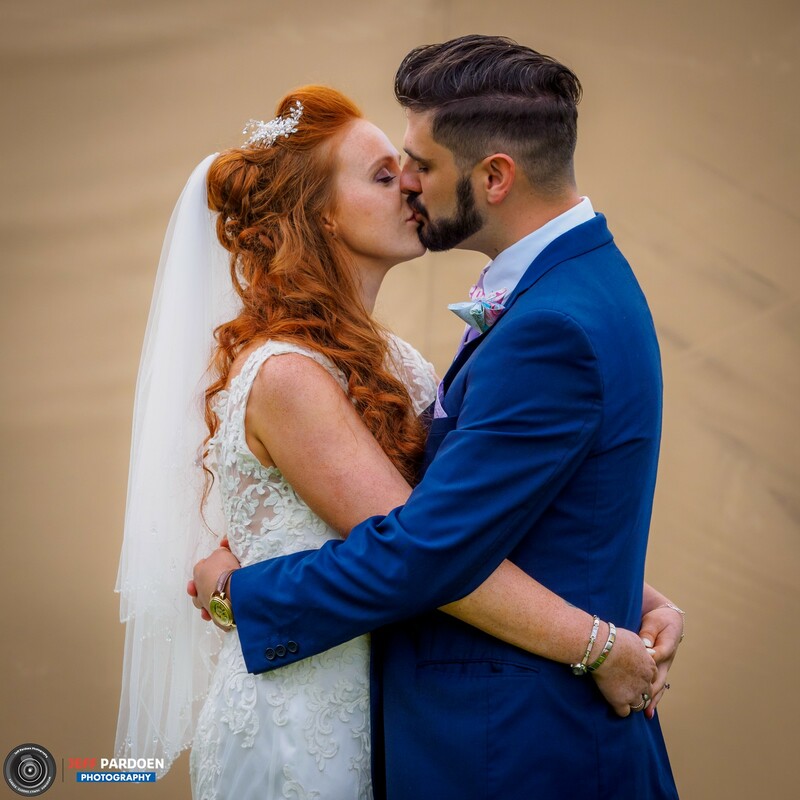 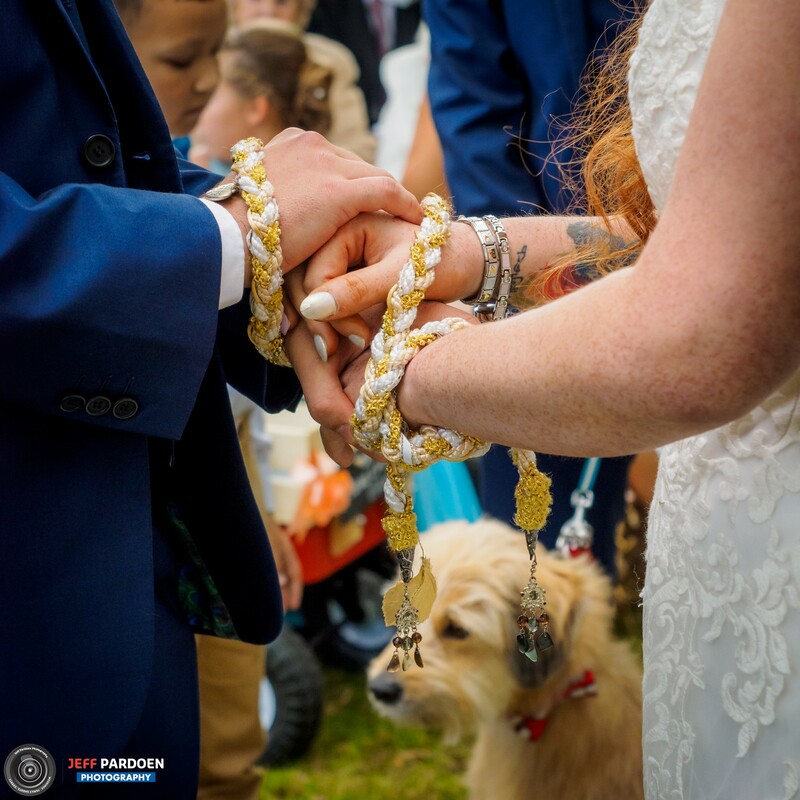 The wedding included handfasting, an old pagan tradition, “a couple will bind their hands together during the wedding ceremony (before, during, or after reciting their vows), often to symbolize their connection and devotion to one another.” (Source). 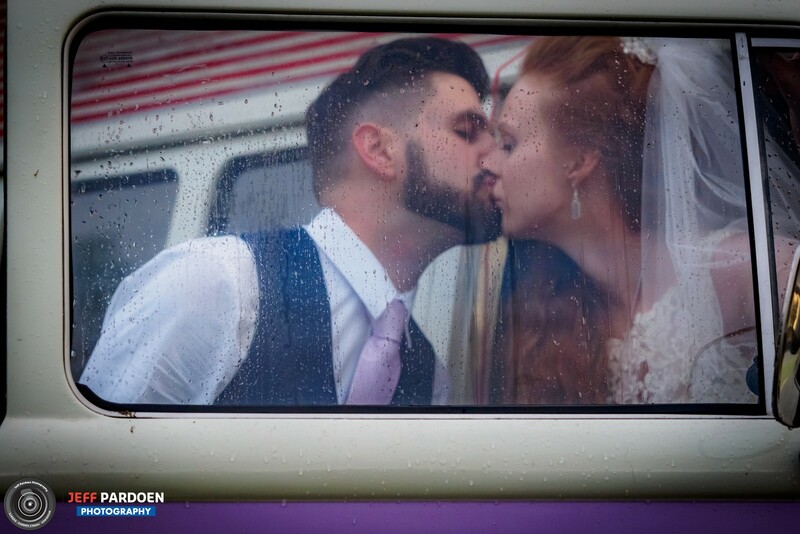 The ceremony had to be sped up a little because the heavens decided to open up again but it was certainly the most unique one I have witnessed to date. 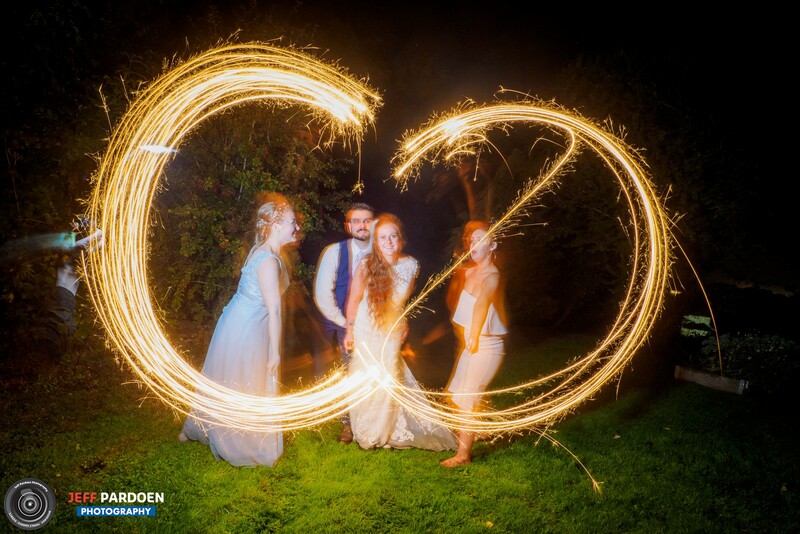 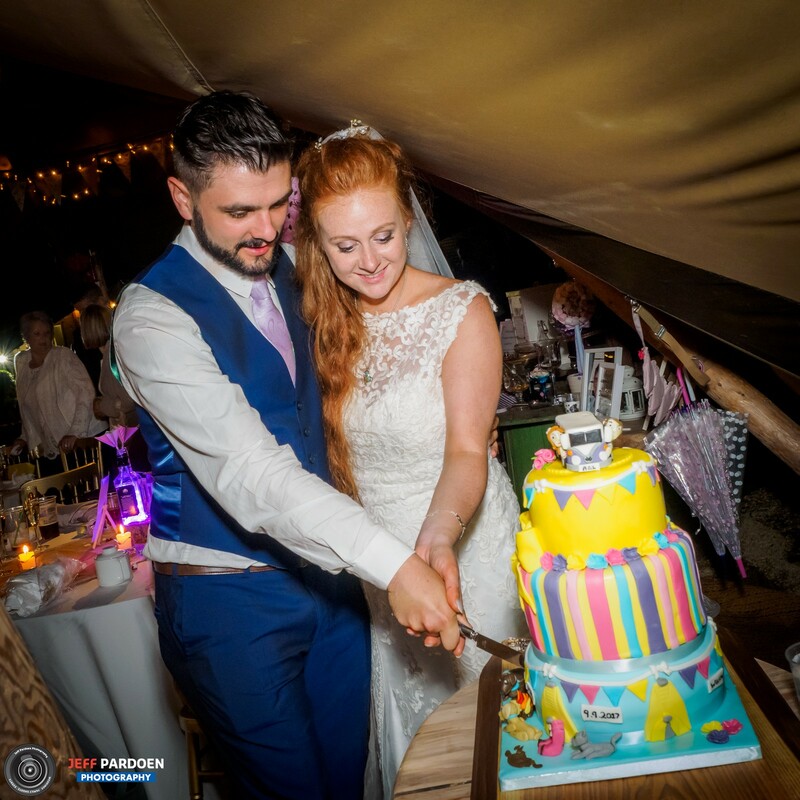 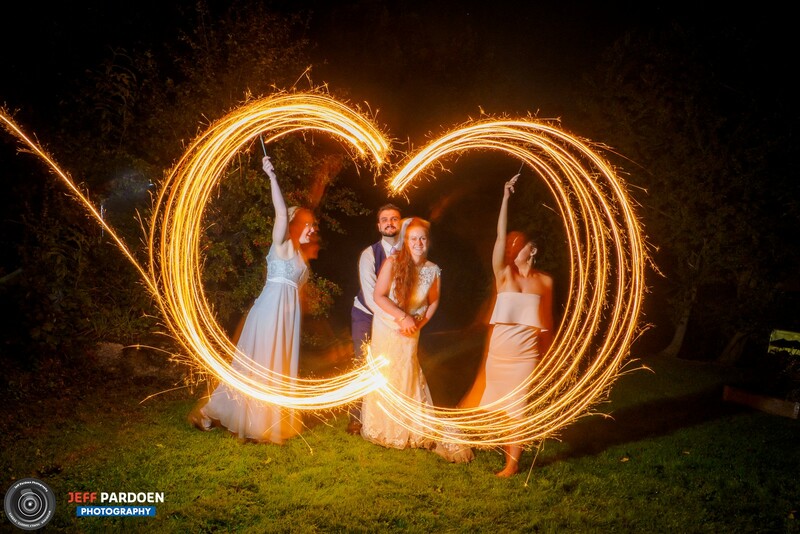 As per usual I stayed until the first dance and the cutting of the cake and ended with a long exposure shot in which the newly weds were lit up with a flash while two of their friends made a big love heart with sparklers. 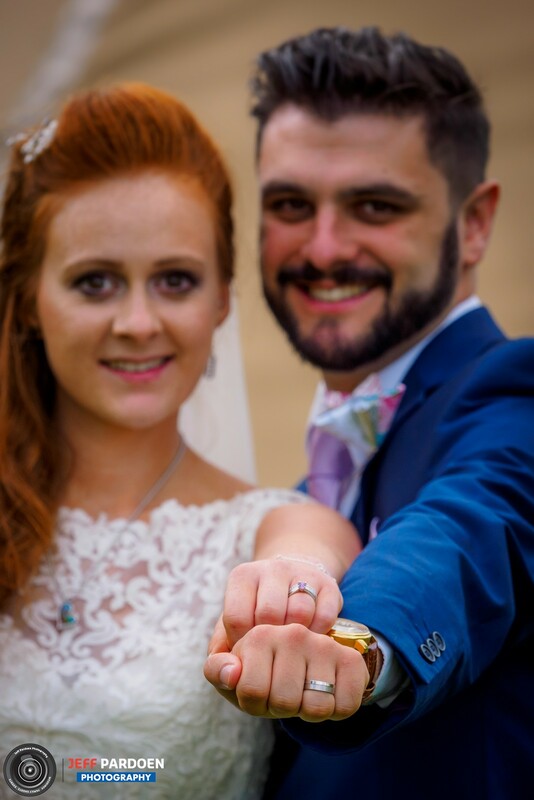 All in all a long but beautiful day, I wish Laura and Lyle all the best!